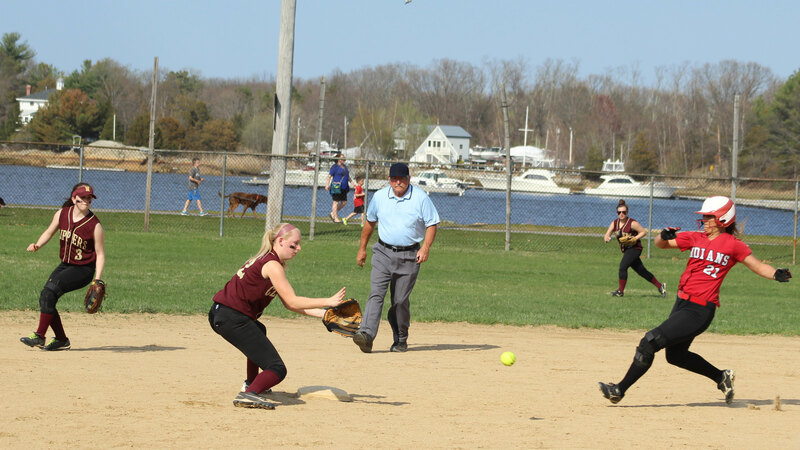 (Newburyport MA) It was the way life should be for the Newburport softball team. 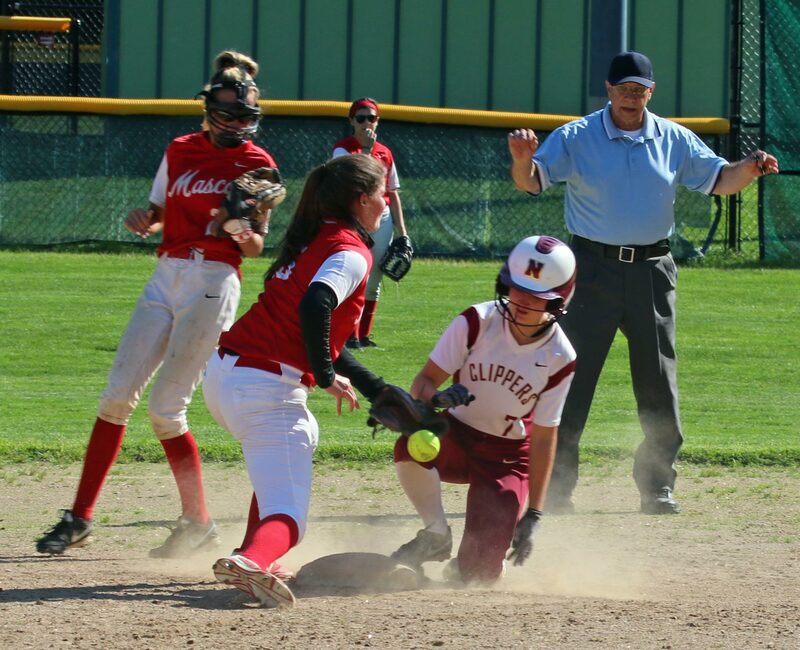 “We kept it together the whole game,” said NHS coach Bob Gillespie after the Clippers had defeated non-league Northeast Metro, 10-1, on a cold Friday afternoon on Pepe Field. 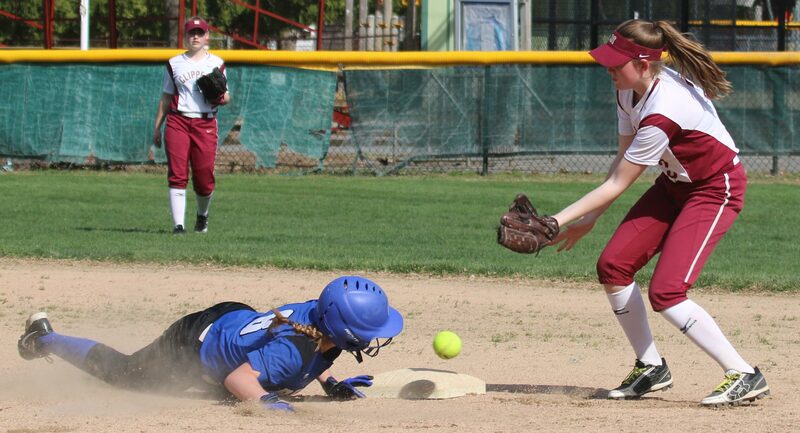 The win gave the Division Two home team their ninth win and a berth in the post-season with two games remaining. 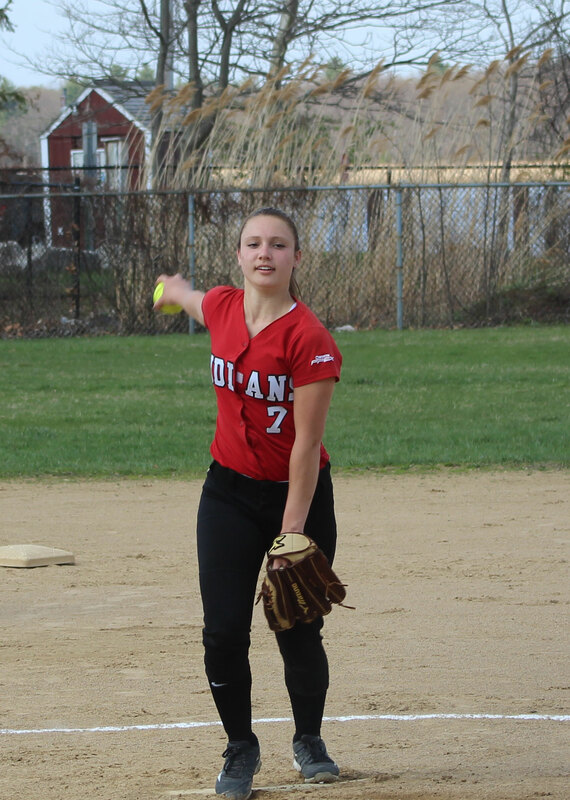 “I was able to throw strikes today and get them to hit,” said Paige post-game. On this successful day, the Clippers (9-7) stayed away from error-driven innings in the field. 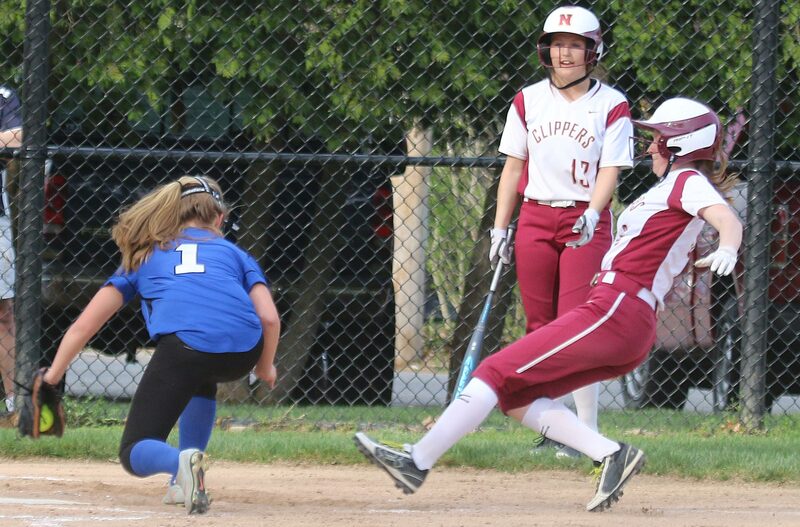 Newburyport survived a drop in the 7th (Annie Siemasko) and a collision in the outfield in the 4th. Northeast Metro wasn’t as fortunate. Two walks and two errors set up the Clippers for three runs in the first. 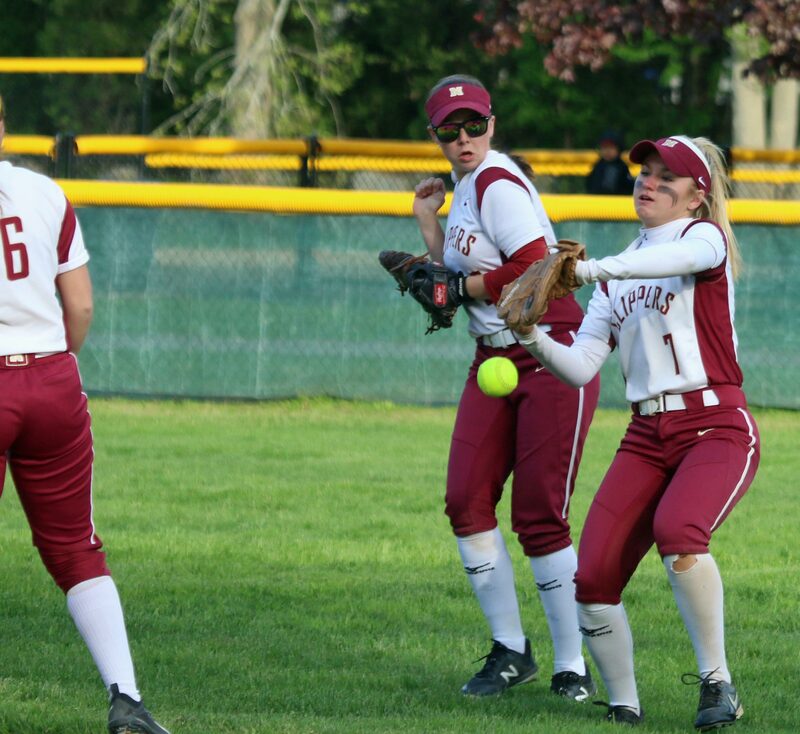 Both walkers (Paige Gouldthorpe, Courtney Walsh) and Annie Siemasko (who reached on shortstop Tae Scott’s error) came across. 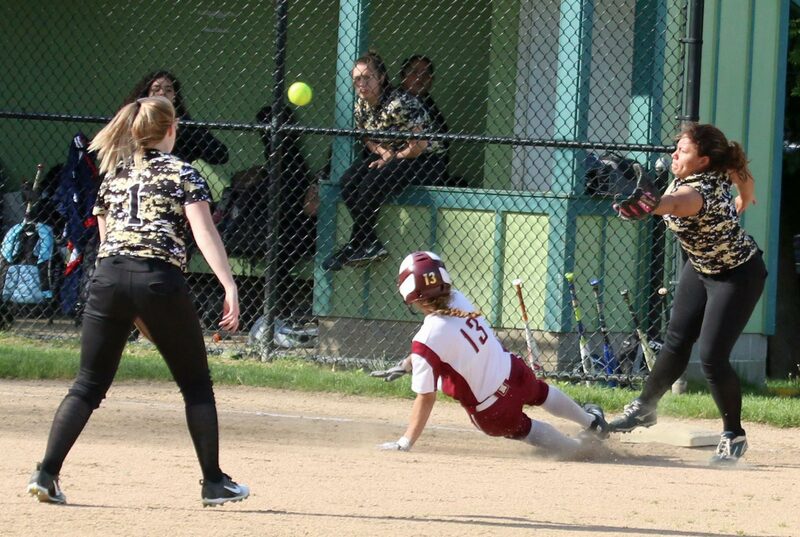 Freshman Cali Caponigro drove a run in during the NHS good start. 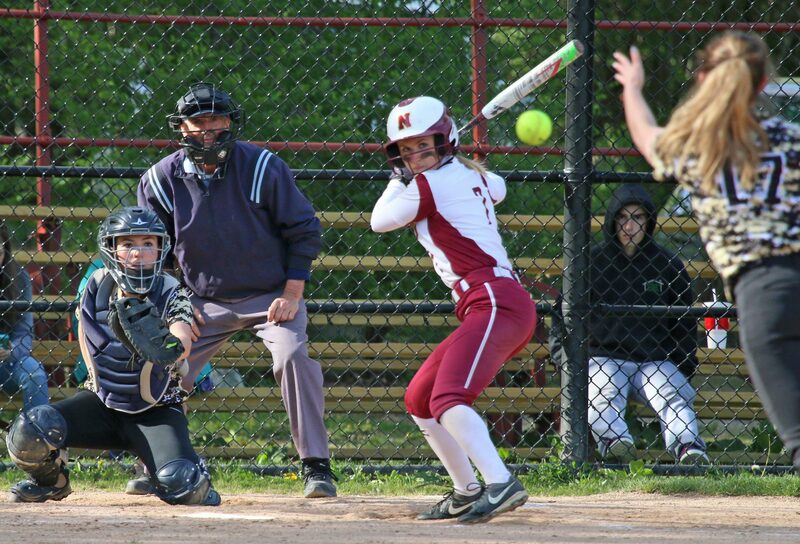 A key to the win was the way Newburyport kept the Knight’s junior slugger Kayleigh Brammer from hurting them. 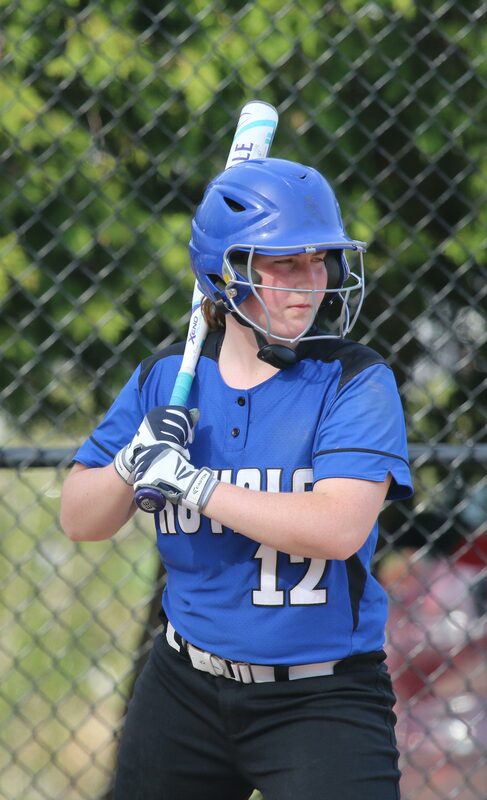 Kayleigh already has ten home runs this season. 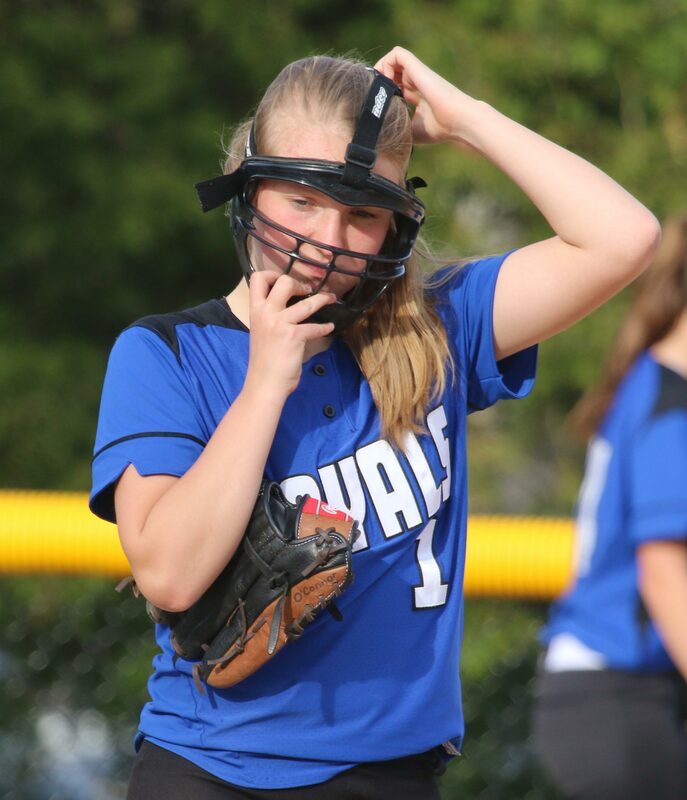 The way Paige was mowing her teammates down, Kayleigh batted only three times and was walked twice. 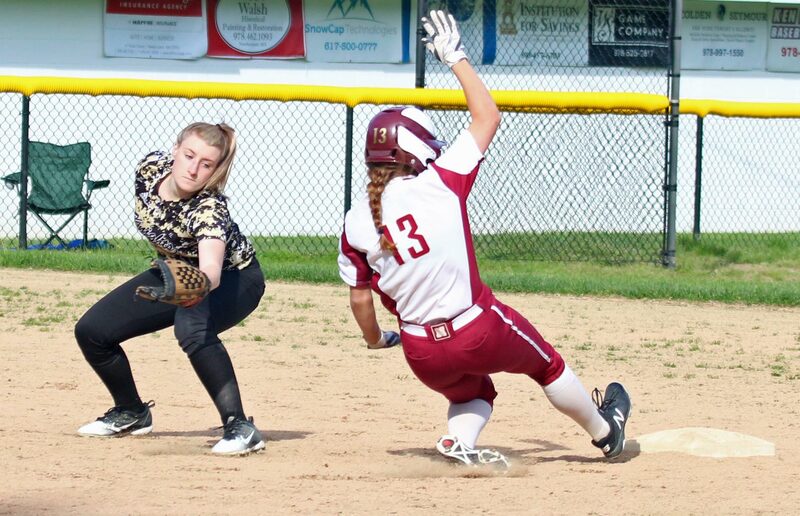 The third time Paige got her to ground out. 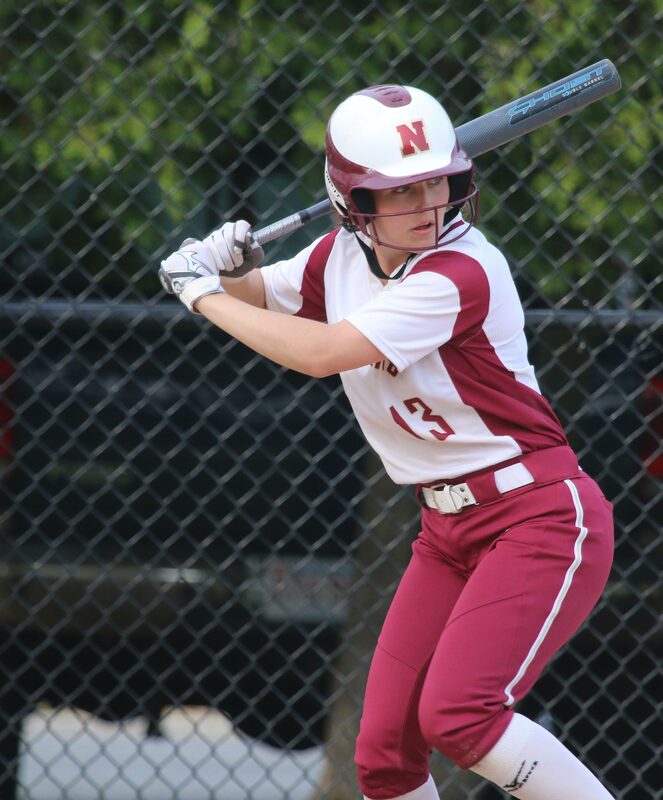 Annie Siemasko launched a home run to right center in the 3rd to boost the NHS advantage to 4-0. The Knights (10-5) answered with a run. 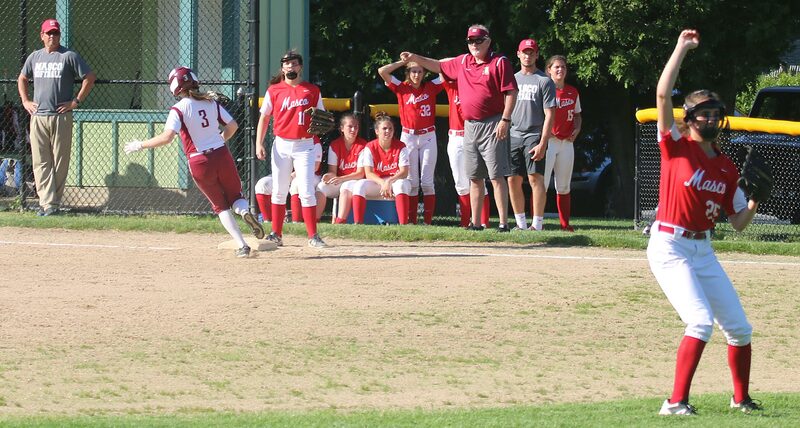 Kayleigh Brammer walked and alertly reached third on Kat Zeylaya’s bunt when no one covered third. 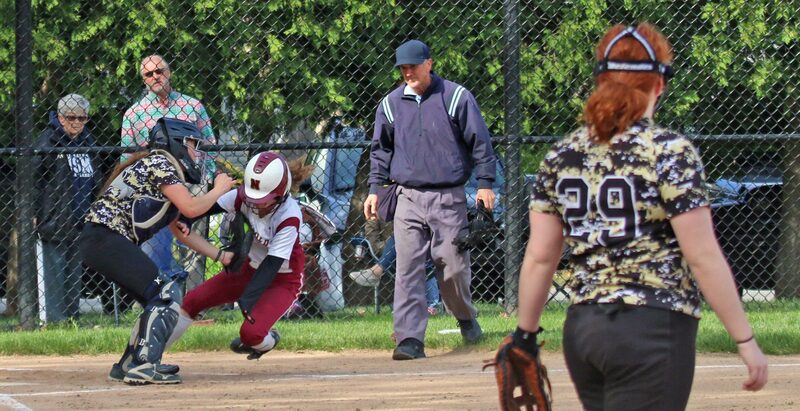 Catcher Sarah Linehan’s wild throw to second allowed Kayleigh to score. 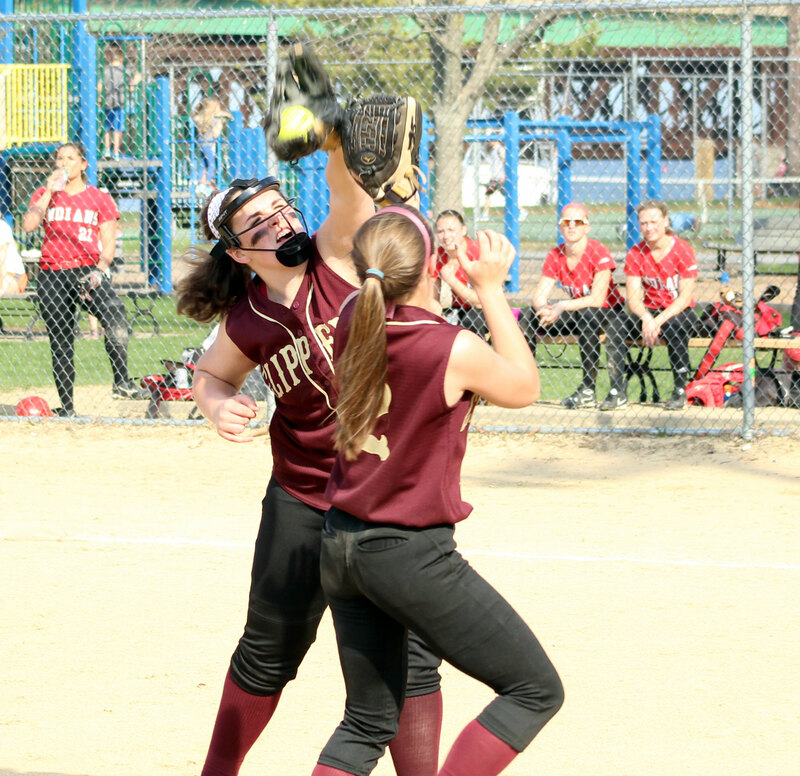 Paige handled the two-on, two-out situation by striking out Joanna Agostini to limit the damage to one run. 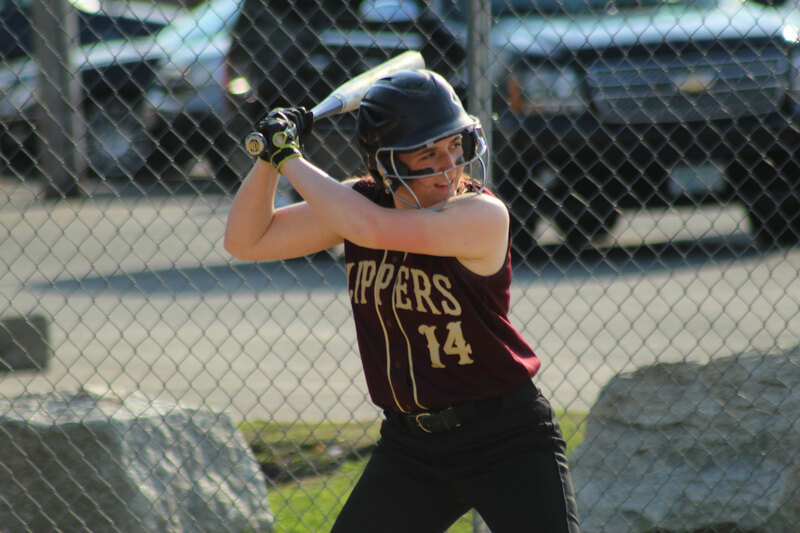 The Clippers fourth was when they expanded their 4-1 lead and gained game-deciding separation from the visitors from Wakefield. 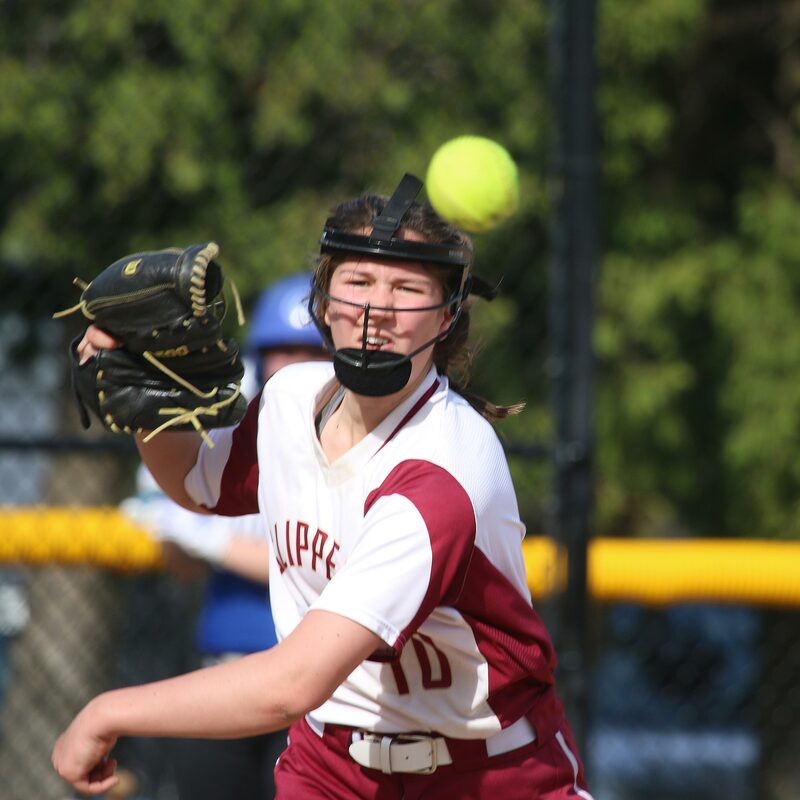 Newburyport had tallied only two runs and had two outs in the 4th inning but the inning got extended when pitcher Julia Carrillo couldn’t handle Courtney Walsh’s grounder. 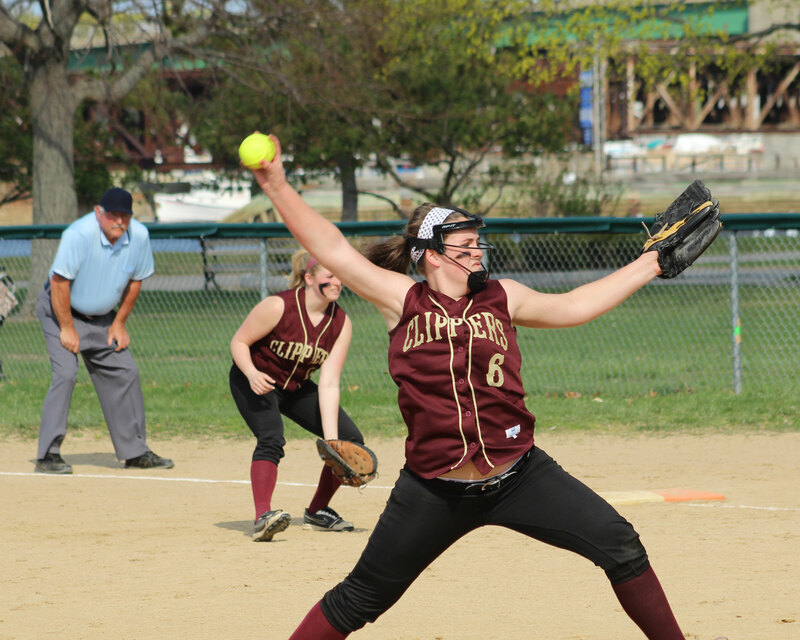 The Clippers would tack on four unearned runs after the miscue. Again, walks played a part. There were four NHS walks and three scored. The 10-1 lead carried the rest of the way. 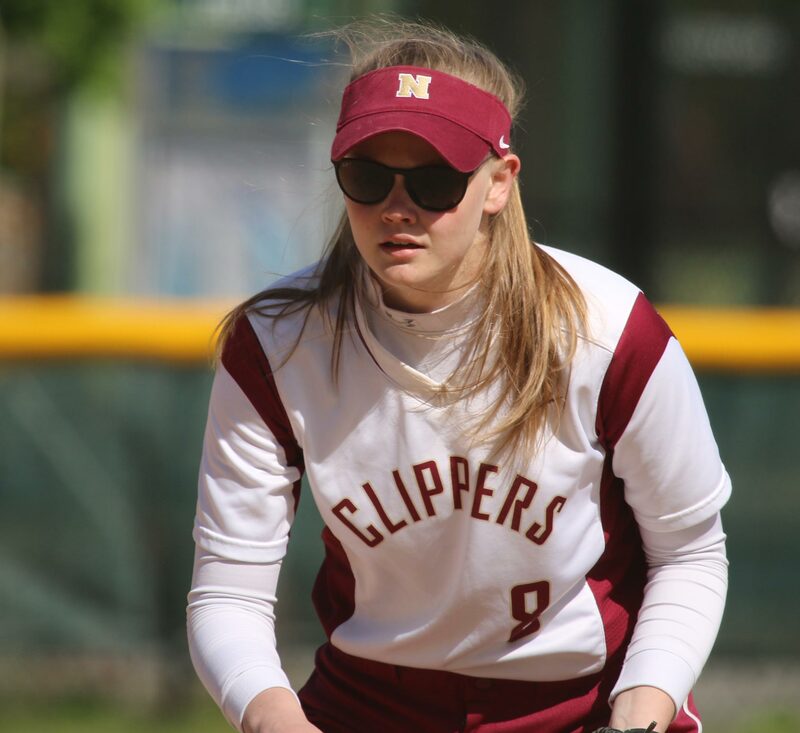 The Knights did get two on in the 7th but a baserunning blunder ruined a promising two-on, no-out’s situation and no inroads were made into the Clippers lead. 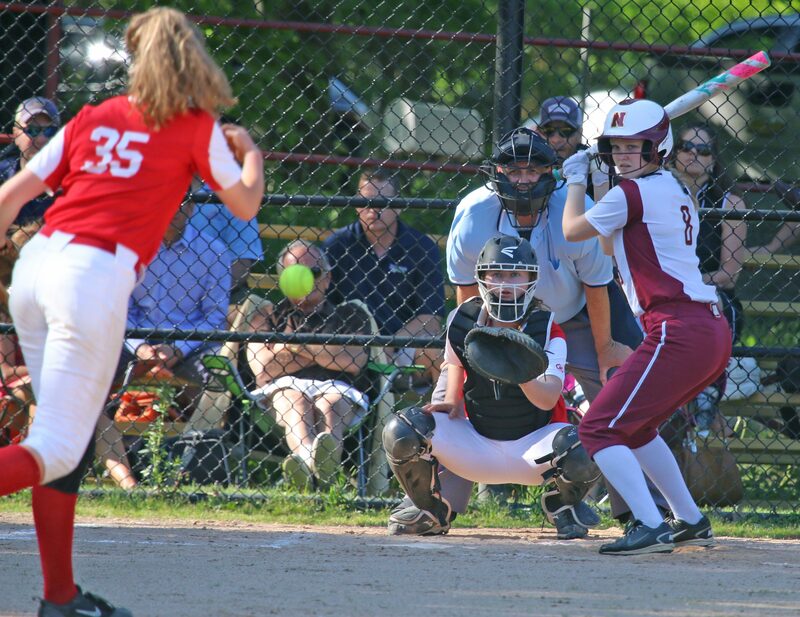 Annie Siemasko paced Newburyport with three RBI and scored three runs. 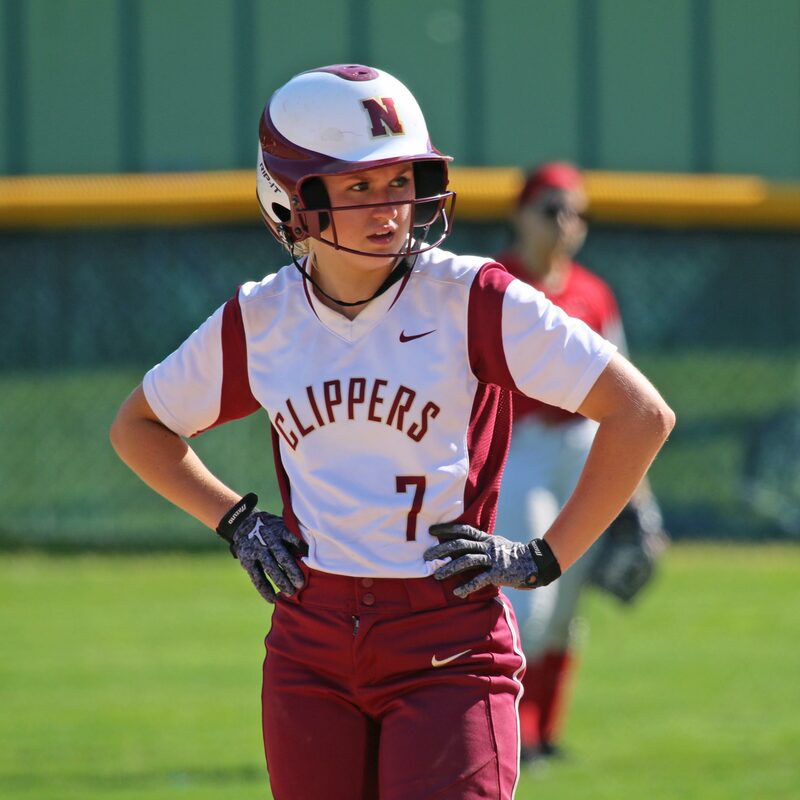 Cali Caponigro drove in two Clippers with two hits. 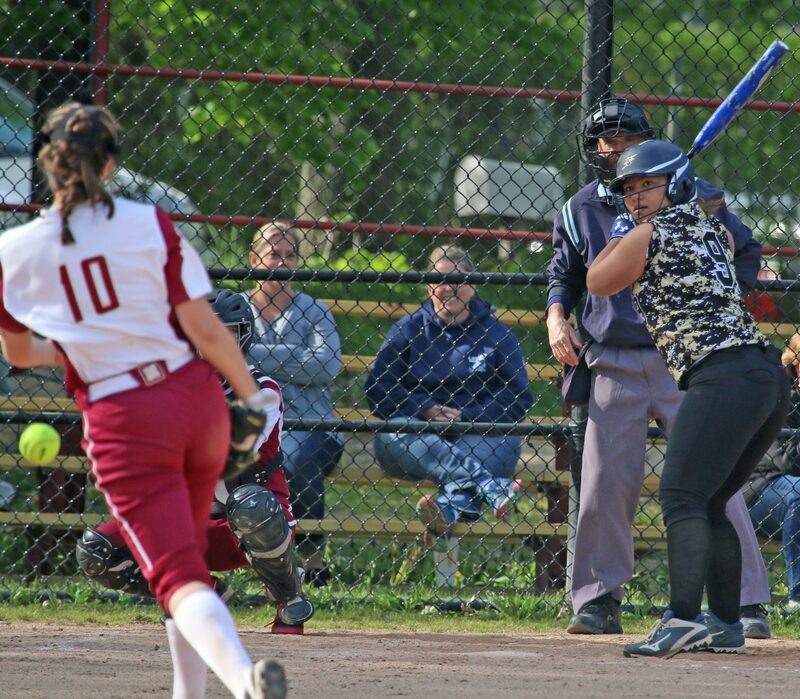 Mikayla Vincent had two hits and an RBI. 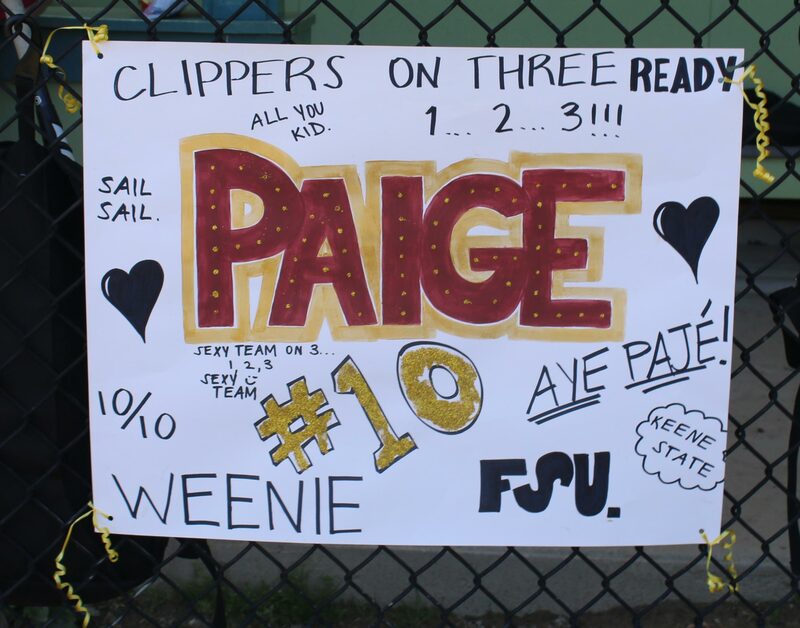 Paige walked three. Two were semi-intentionals to Kayleigh Brammer. 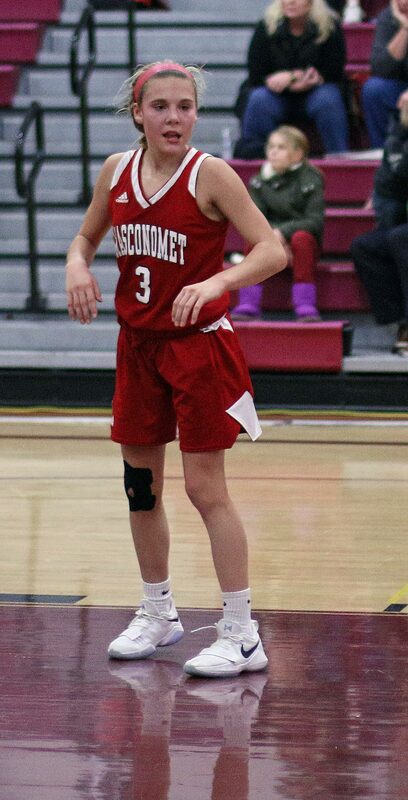 The Keene State commit handled five chances flawlessly. 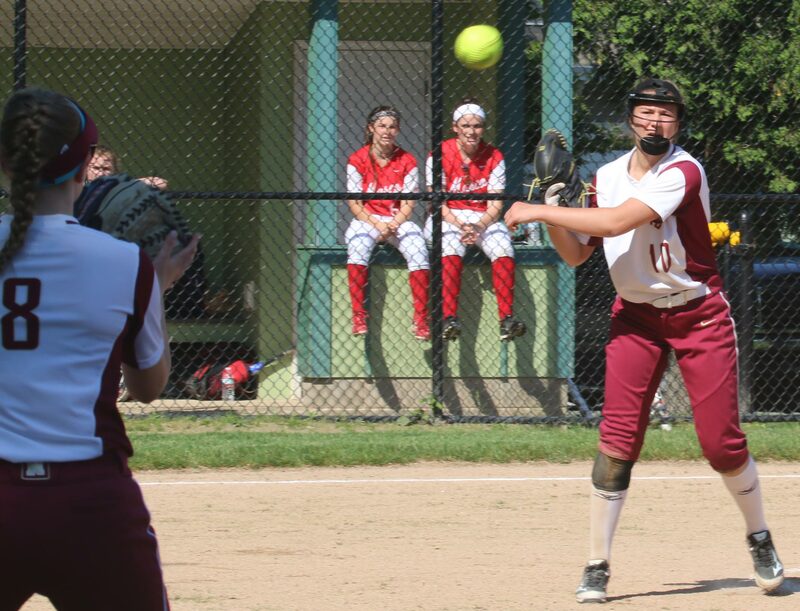 Northeast Metro (Division Three) is in the Commonwealth Athletic Conference with teams such as Whittier. The Knights had won three of their last four games before the loss today. It was a cold afternoon in the shade and not too bad in the sun. I am always looking to expand my vocabulary. New word: frenemy. 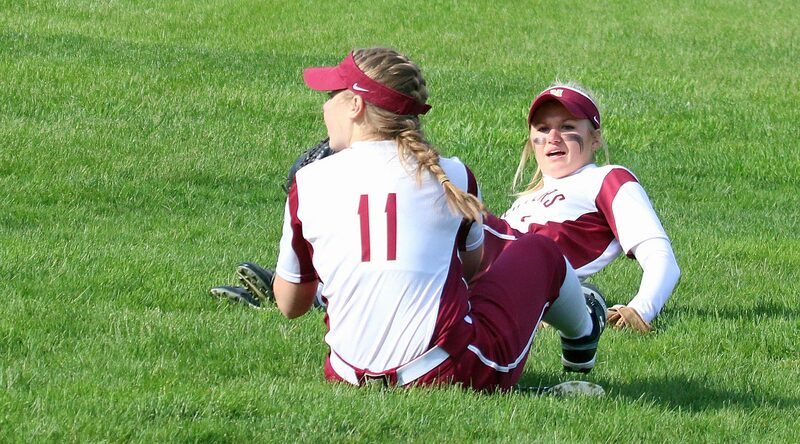 Paige dropped that one on me to explain her relationship to shortstop Bridget Sheehan of Triton who watched the game. 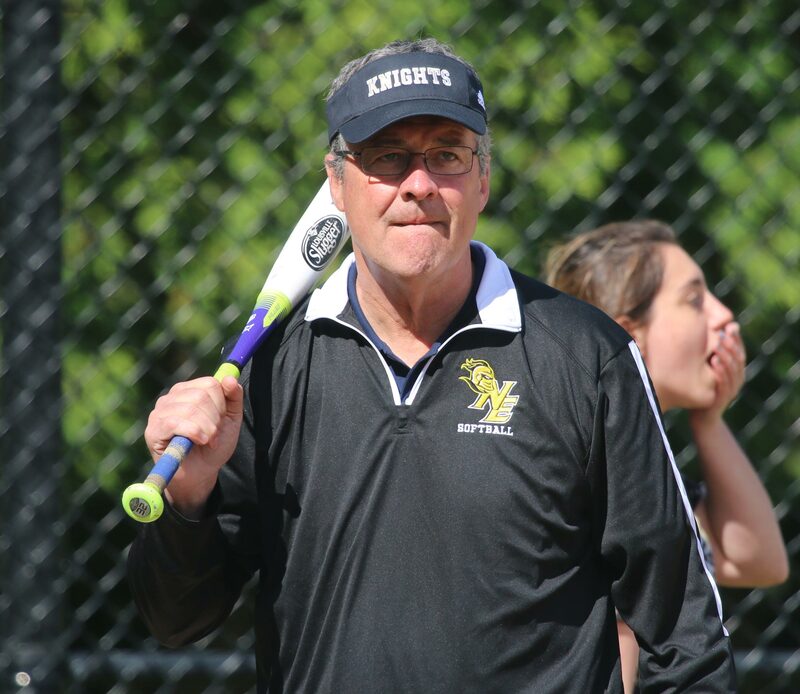 Bridget’s Vikings (15-1) take on undefeated North Reading on Monday afternoon at Triton. That should be a game to see……..and blog about. 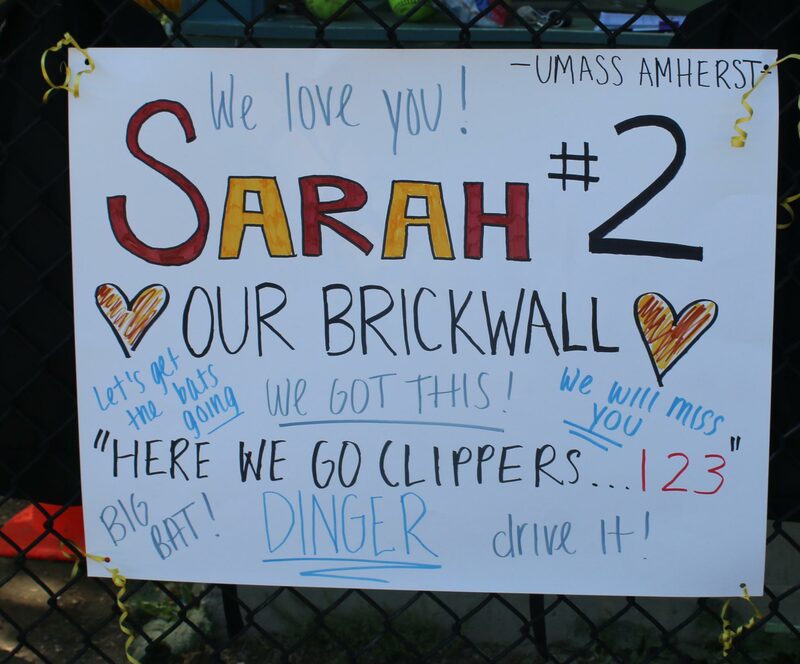 Those words certainly applied to the Newburyport softball team as they recovered from a 17-1 pounding by Triton to come back the next day and defeat Georgetown, 9-2, on a sunny Wednesday afternoon. Who could argue with any of that? 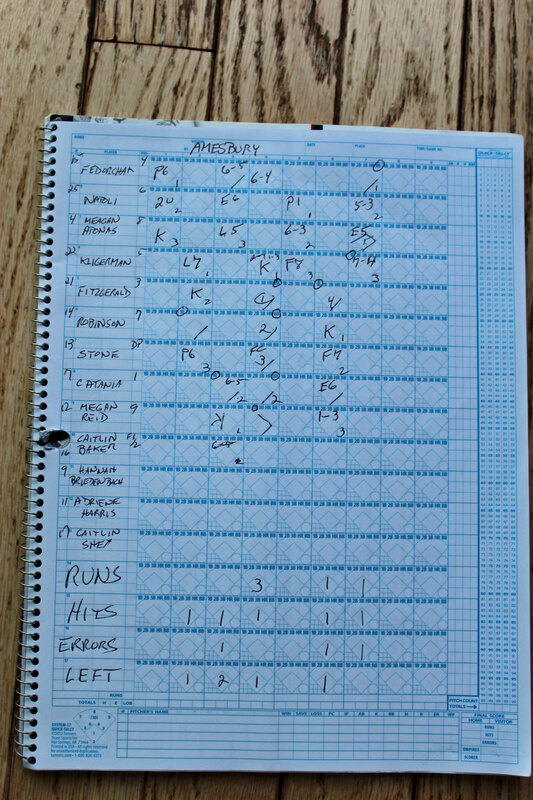 The Clippers (5-3) whacked fourteen hits, had baserunners galore, and committed one error. 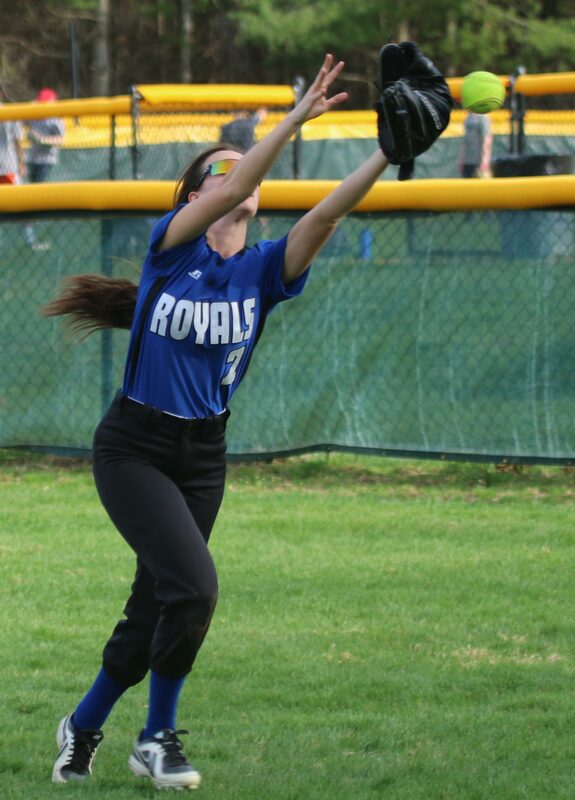 The Royals (1-6) jumped out to a 2 zip lead in the opening frame as some of the bad vibes from the Triton game lingered for a half inning. 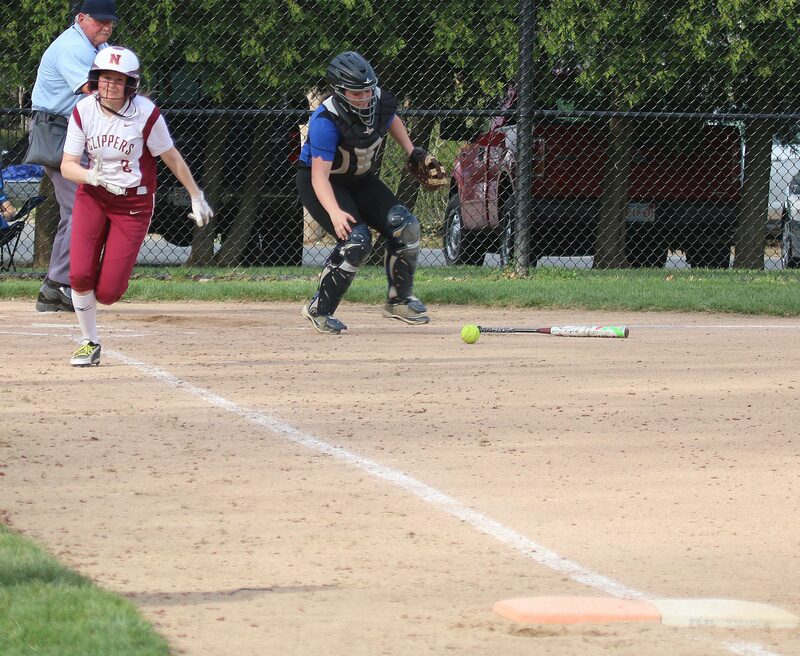 Two walks, a wild pitch, and a misread in left (Cali Caponigro) turned into two Georgetown runs. 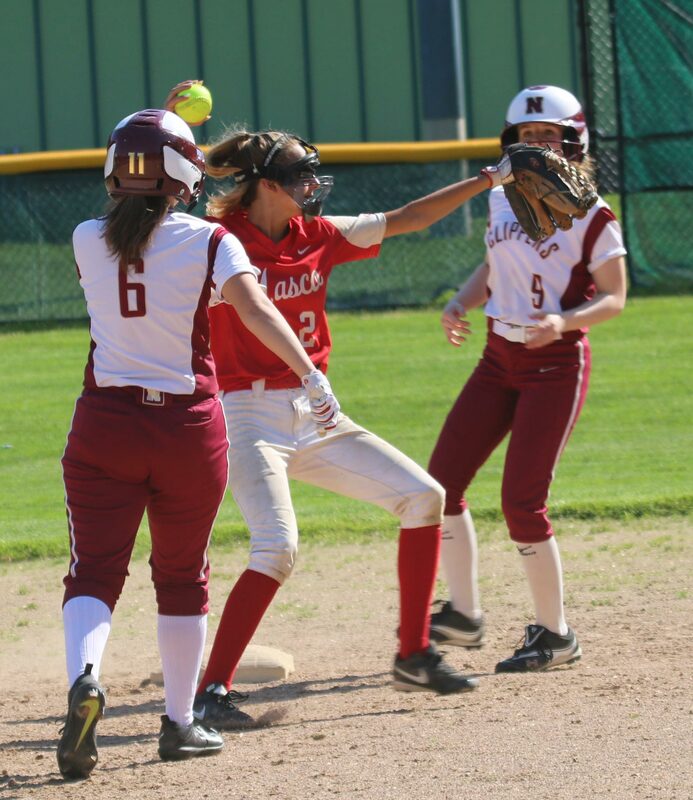 Caitlyn Donoghue and Maeve McNeil had the RBIs. 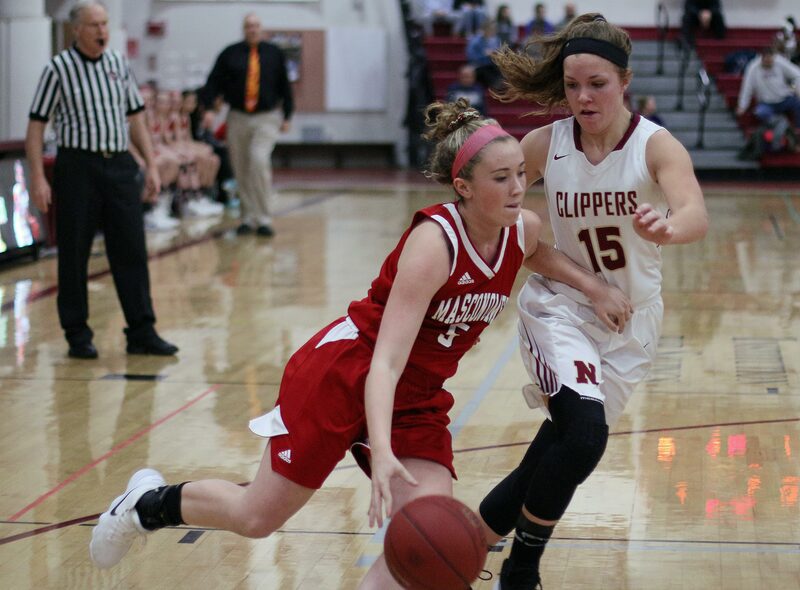 After that shaky start, however, the Clippers changed from poor to excellent led by senior Paige Gouldthorpe. 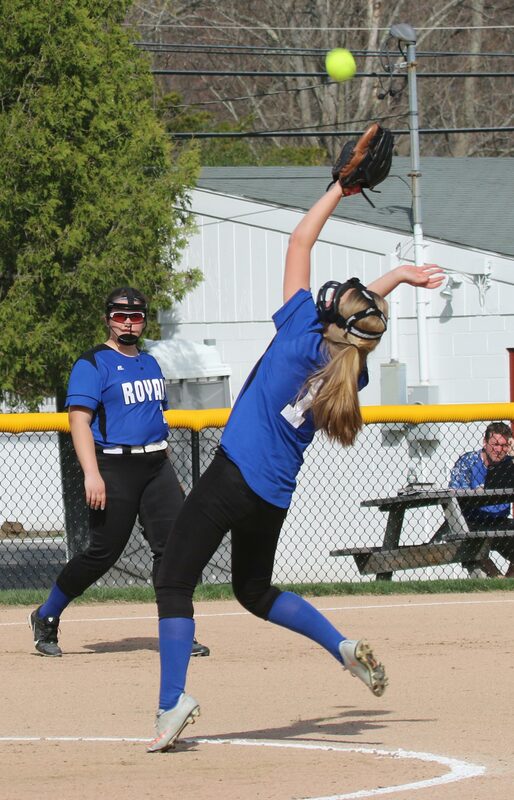 After giving up two hits in the first inning, Paige surrendered just one (Kate Irons) the final six innings. 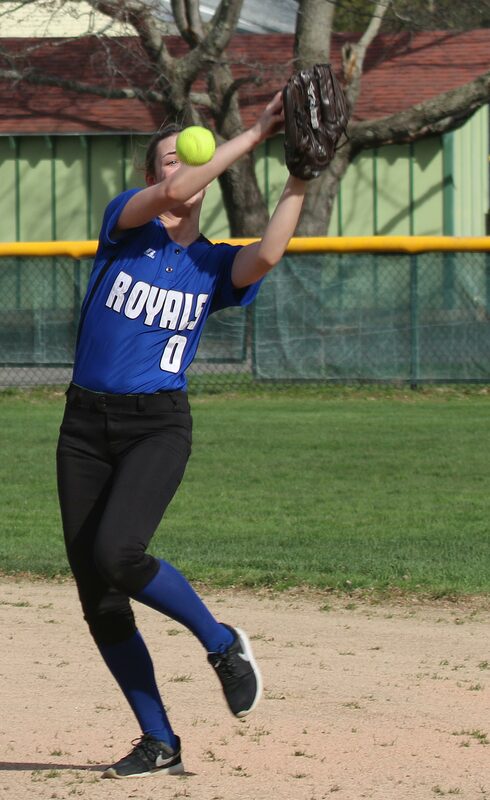 Today Paige also had the strikeout pitch working and set down eleven Royals via the K route. 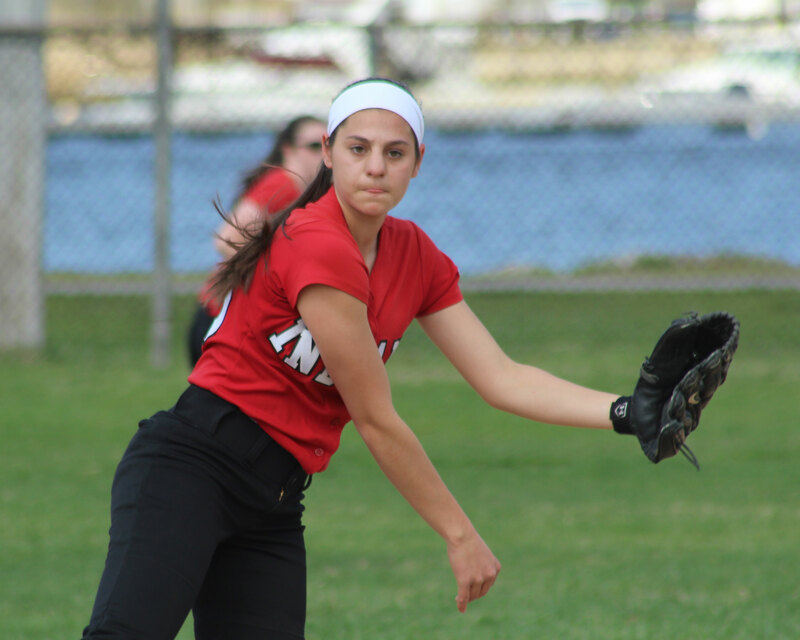 During one stretch during the 2nd and 3rd innings, she fanned five of six batters. Impressive! Newburyport hit from top to bottom. Everyone contributed. 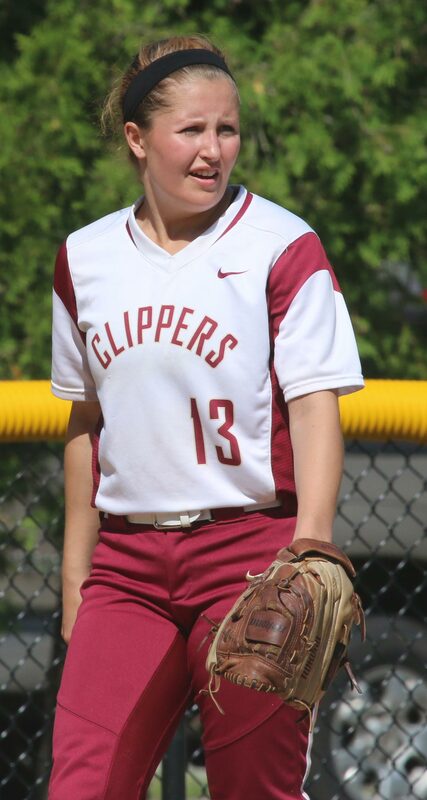 Annie Siemasko was the only Clipper held hitless, but she did have a run-scoring sacrifice fly. The Clippers tied things in the first. 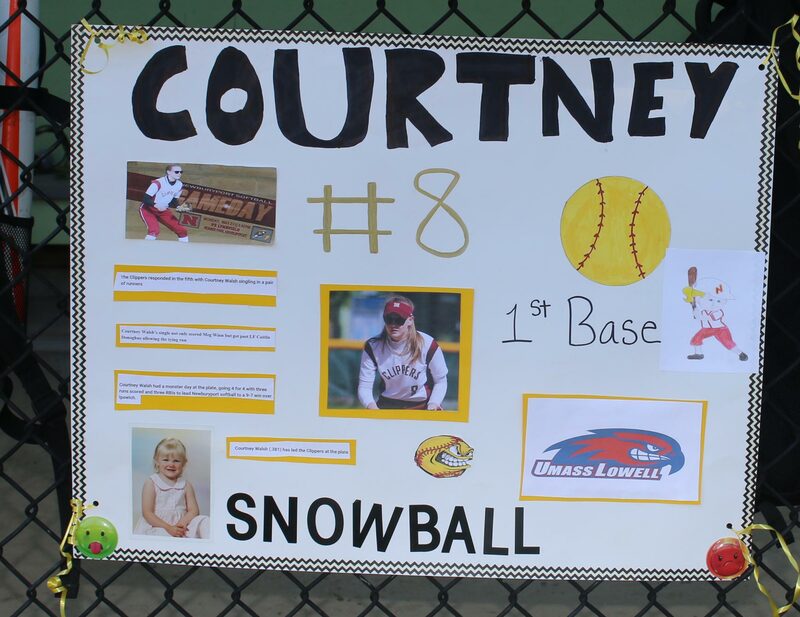 Courtney Walsh’s single not only scored Meg Winn but got past LF Caitlin Donoghue allowing the tying run (Liv Salvatore) to cross. 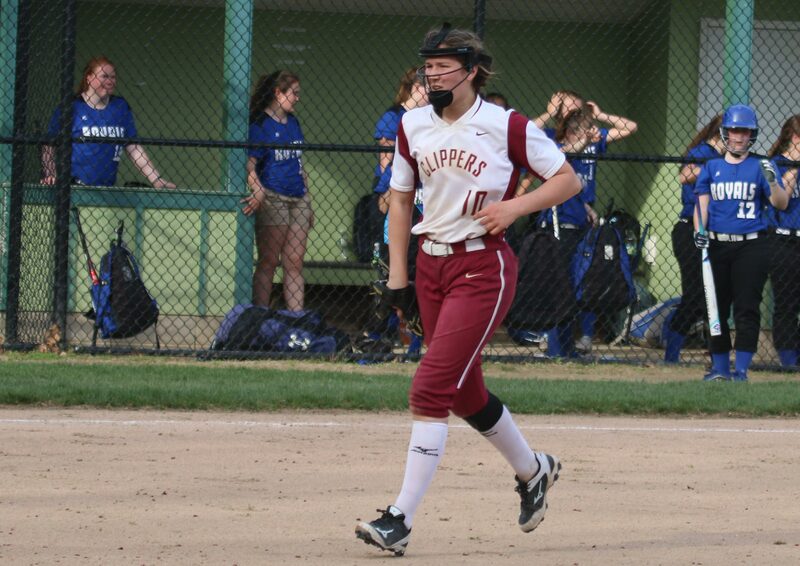 Newburyport took the lead, 4-2, in the second thanks to two G’Town errors (3B Alyssa Gaeta & C Maeve McNeil). 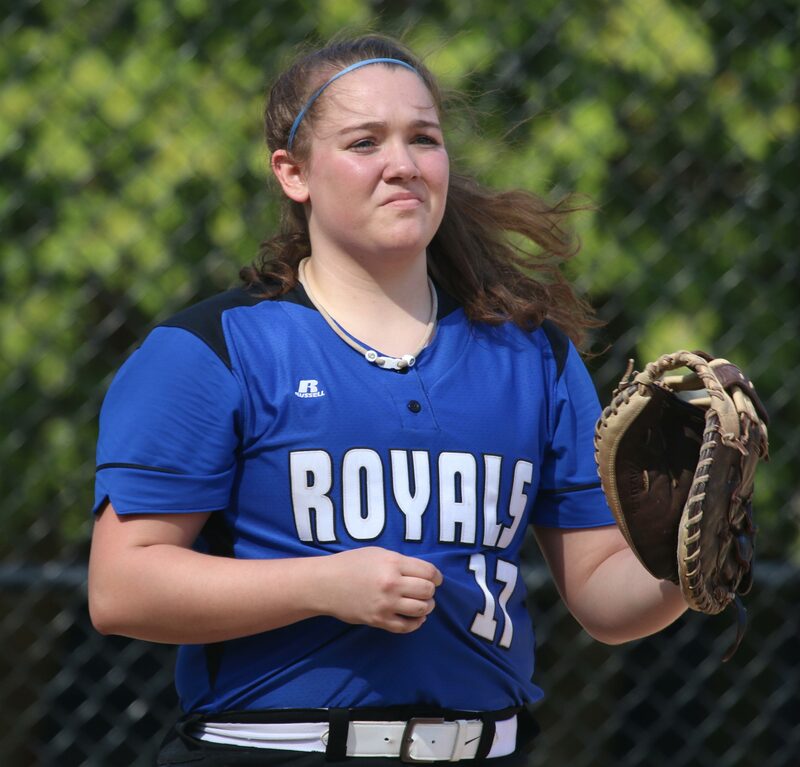 Paige got out of a mini-jam (runner on third) in the Royals third, ending that inning with a strikeout and an assist. The Clippers most productive inning was the 4th when they pushed across three runs. 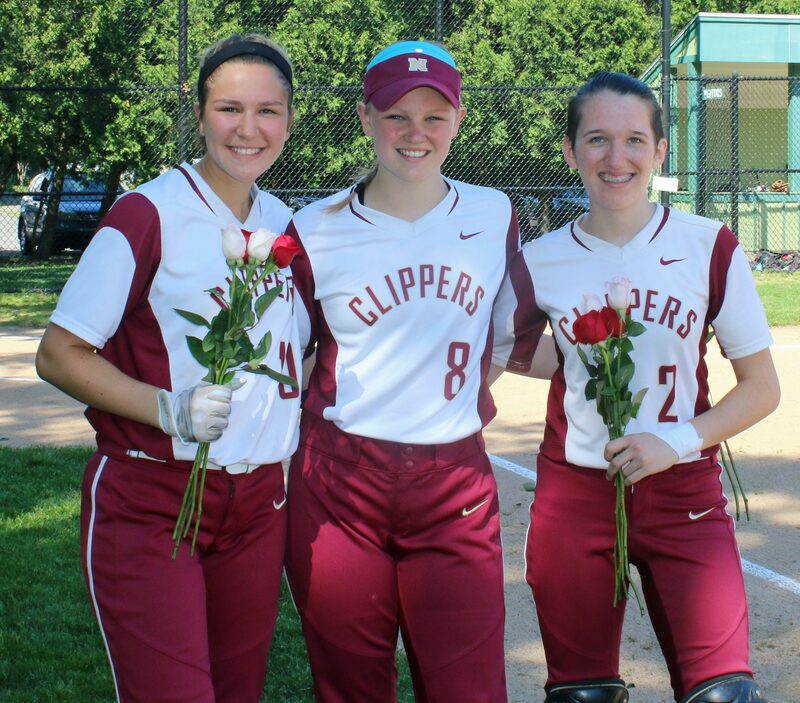 Annie Siemasko, Liv Salvatore, and Sarah Linehan had runs batted in. 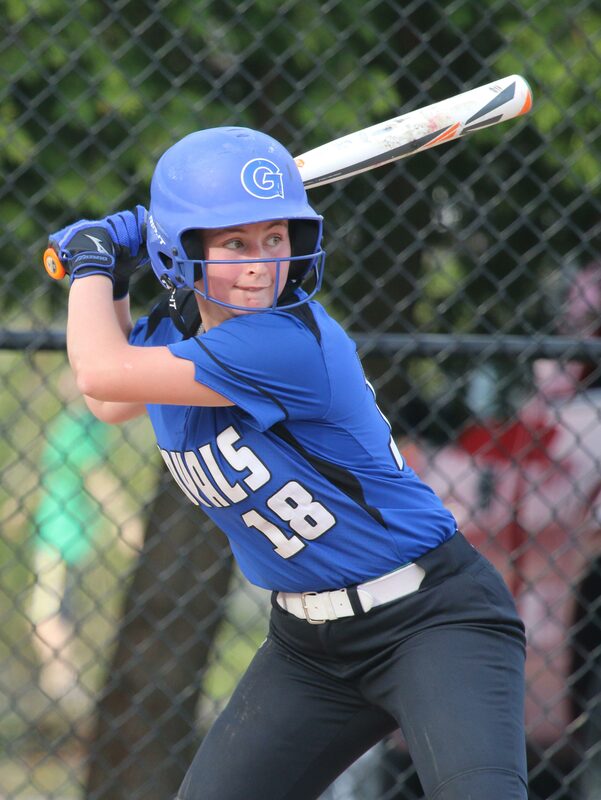 Georgetown starter Colleen O’Connor walked in a run in the 5th (Paige Gouldthorpe) and then Paige tripled and drove in NHS’s final run in the sixth. 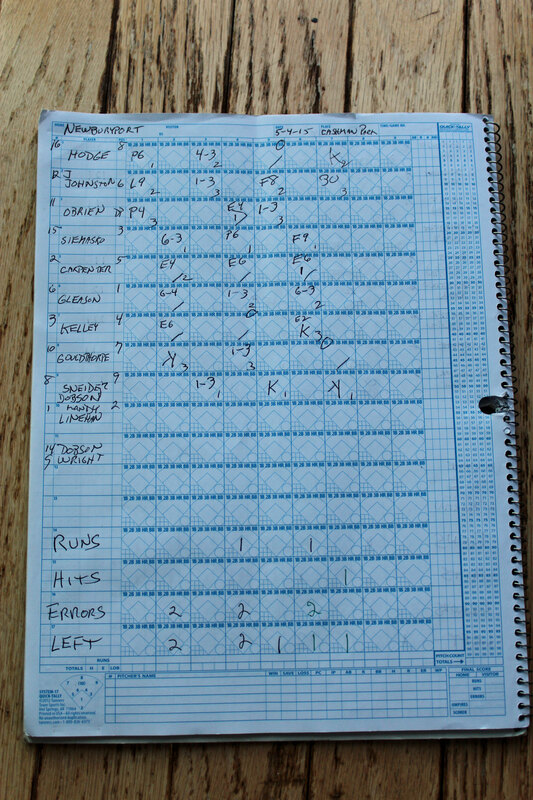 The numbers certainly didn’t lie: eleven strikeouts, four hits, three runs scored, and an RBI. 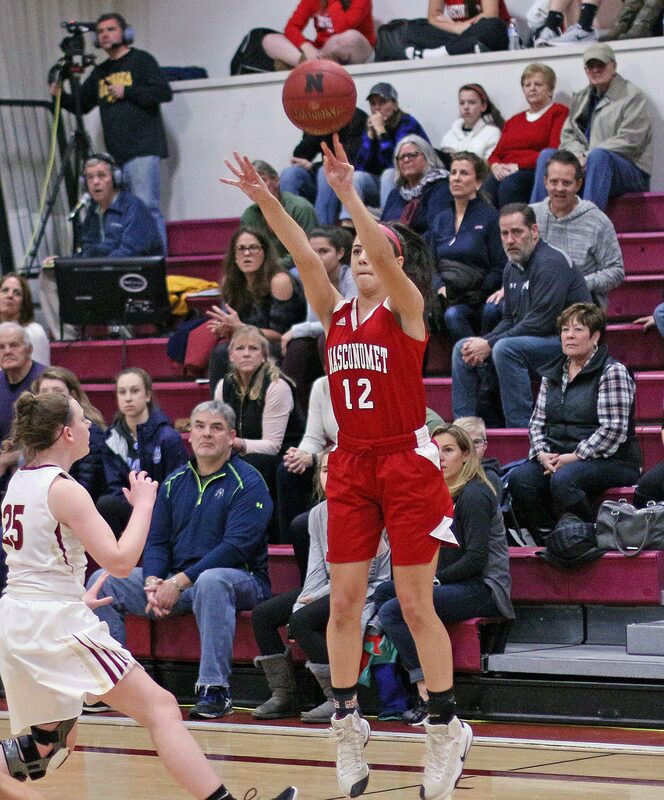 Terrific game for the Keene State commit. 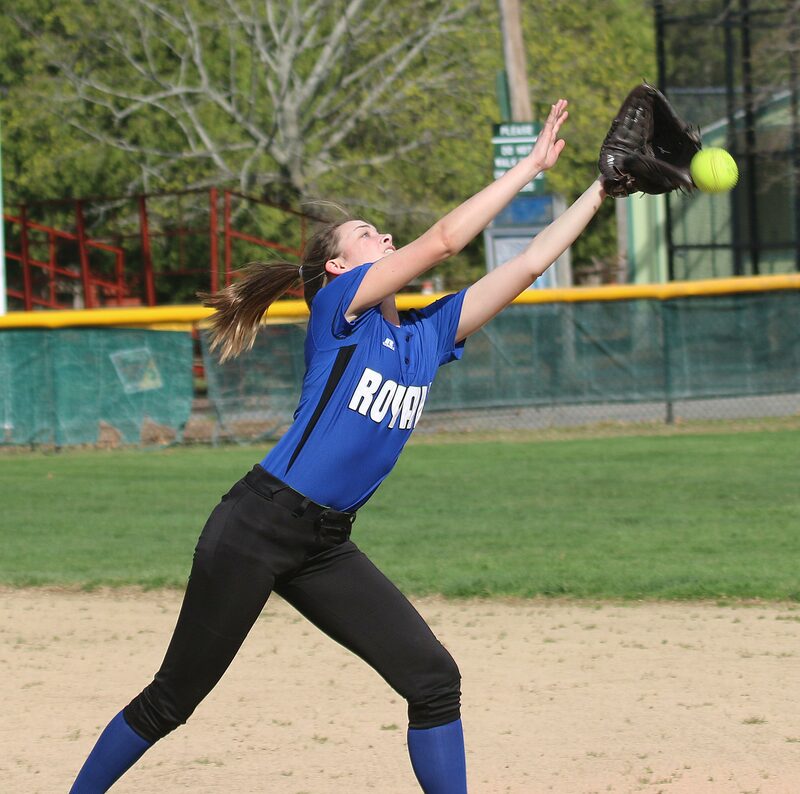 Every regular fly ball in her direction was routine for her. Some of the “routine” ones were well hit. 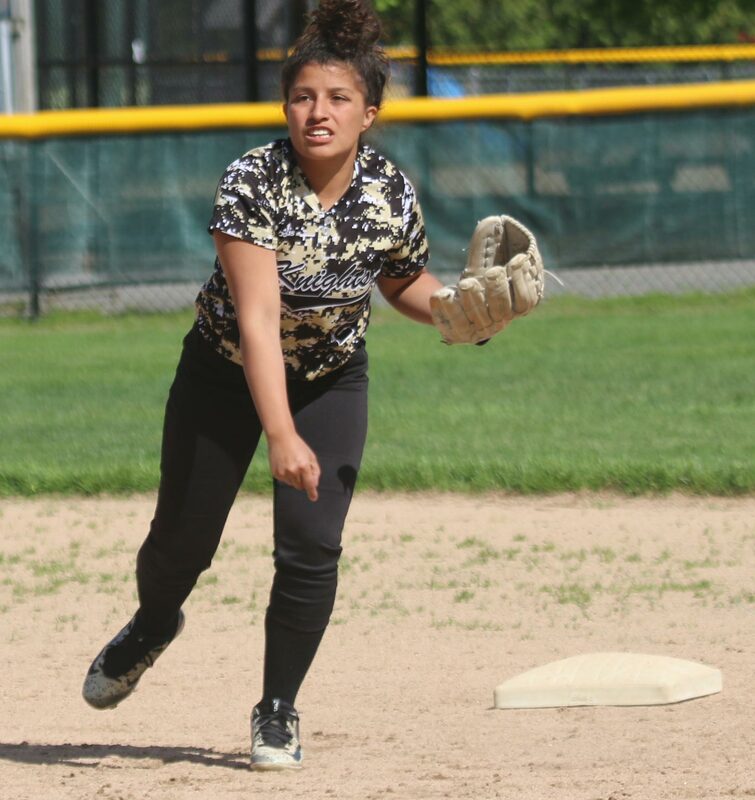 In the second she made a lunging catch on a sinking line drive. 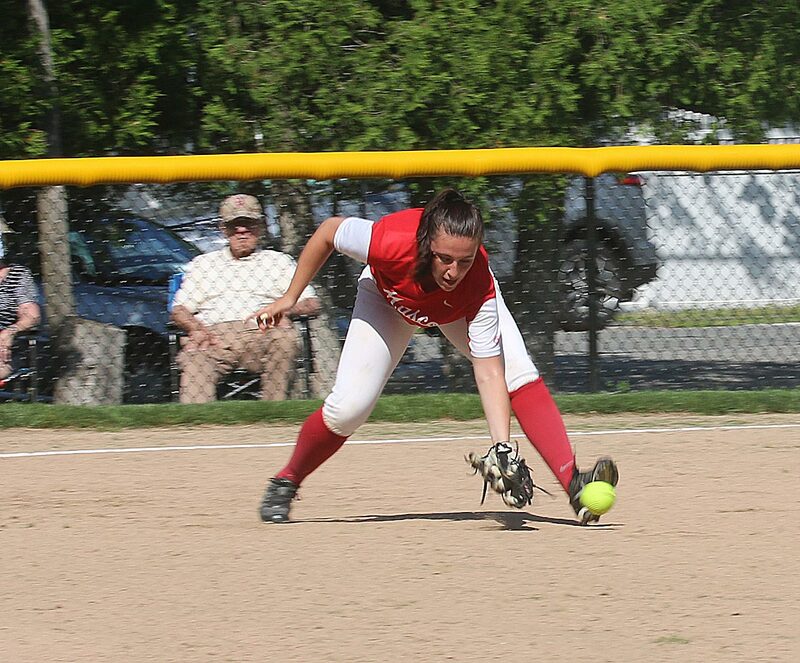 In the third she fielded a shot in short center and combined with shortstop Brenna Donoghue to get a force out. I was told that she is also an excellent hockey player. 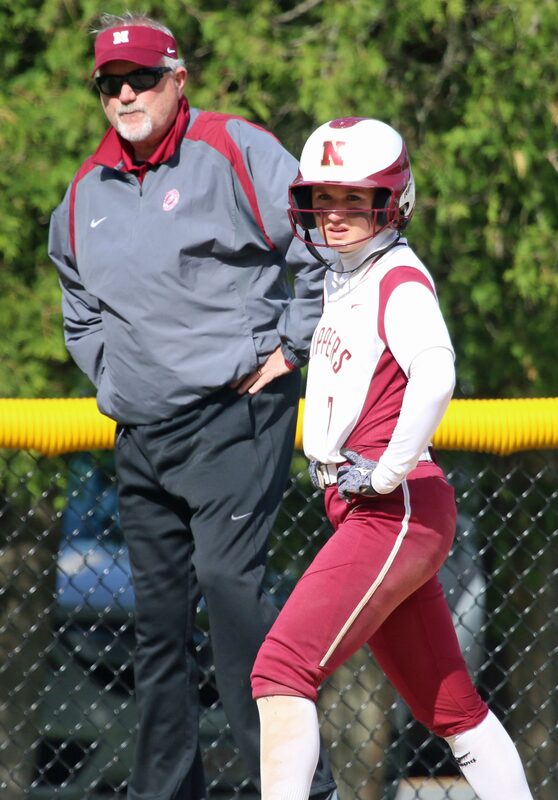 In today’s game, Kate reached base four times. Good athlete! 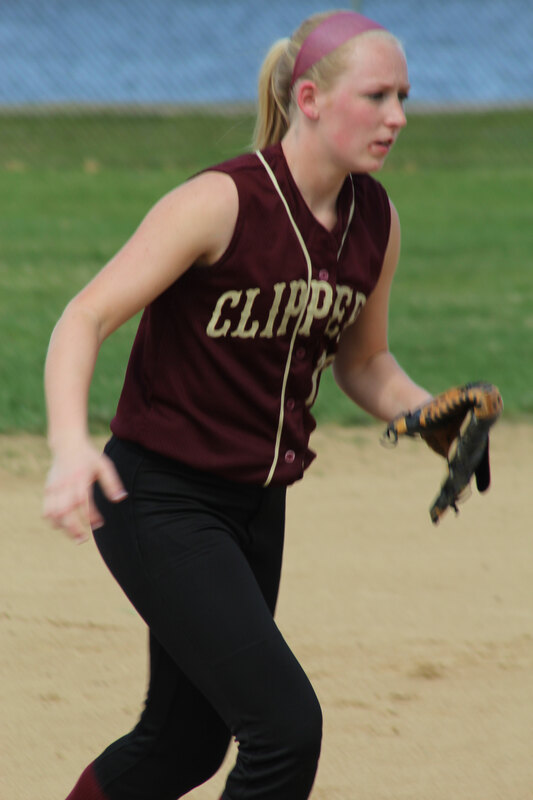 Junior Meg Winn had three hits for the Clippers and scored twice. 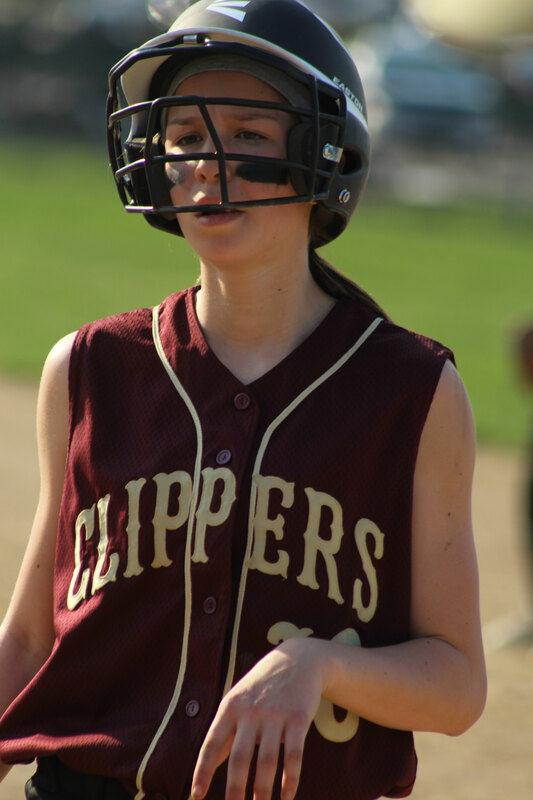 NHS catcher Sarah Linehan is planning to attend UM Amherst and study astro-physics. The weather was remarkable; 80’s with a breeze. Don’t expect it to last! 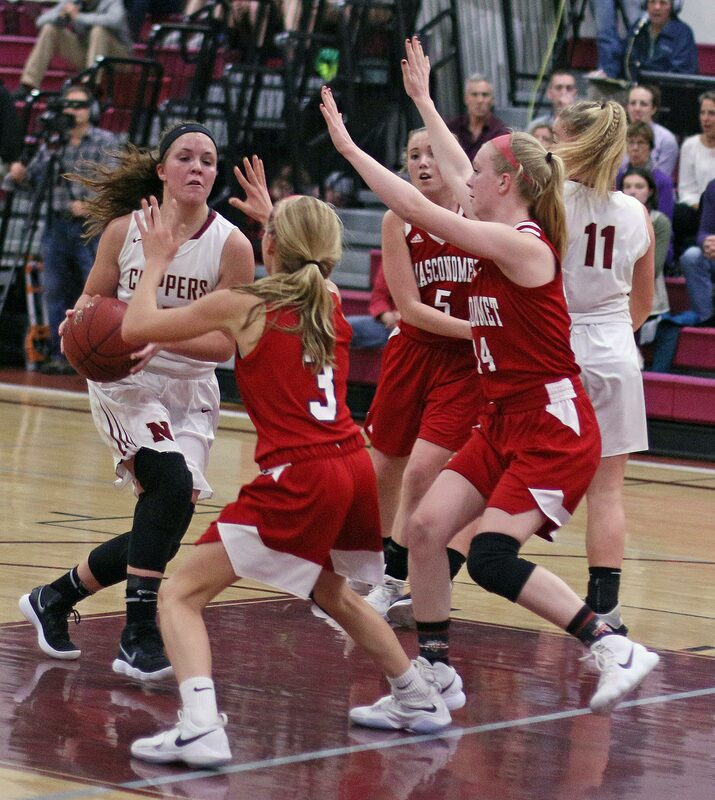 (Newburyport MA) The Newburyport girls basketball team started this season with seven straight wins. But how good were they since they hadn’t faced Masconomet and Pentucket? Tonight we found out. 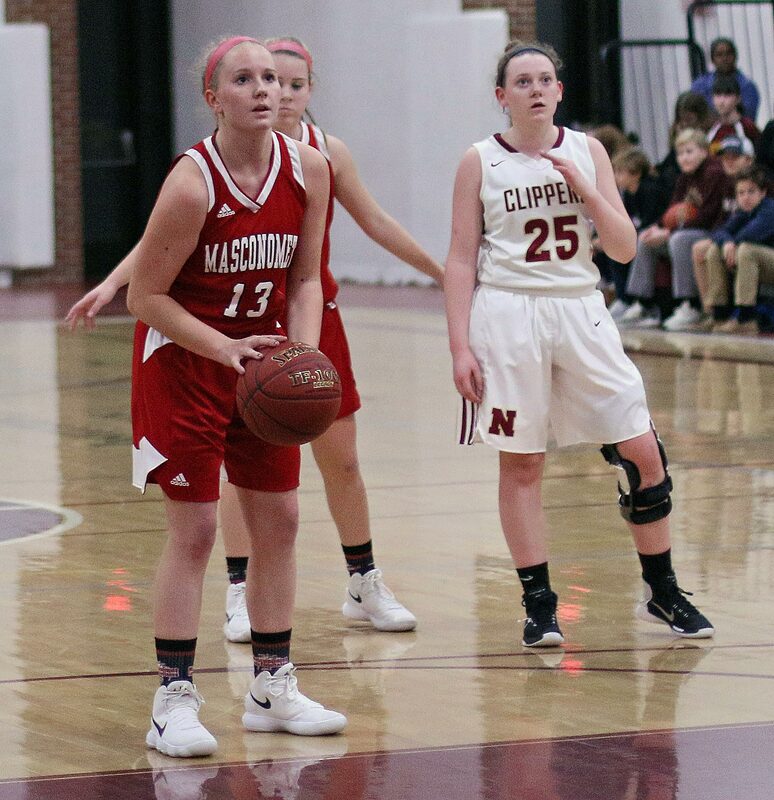 Masco came to town and defeated the Clippers, 52-42, on Friday night in Cape Ann League action. 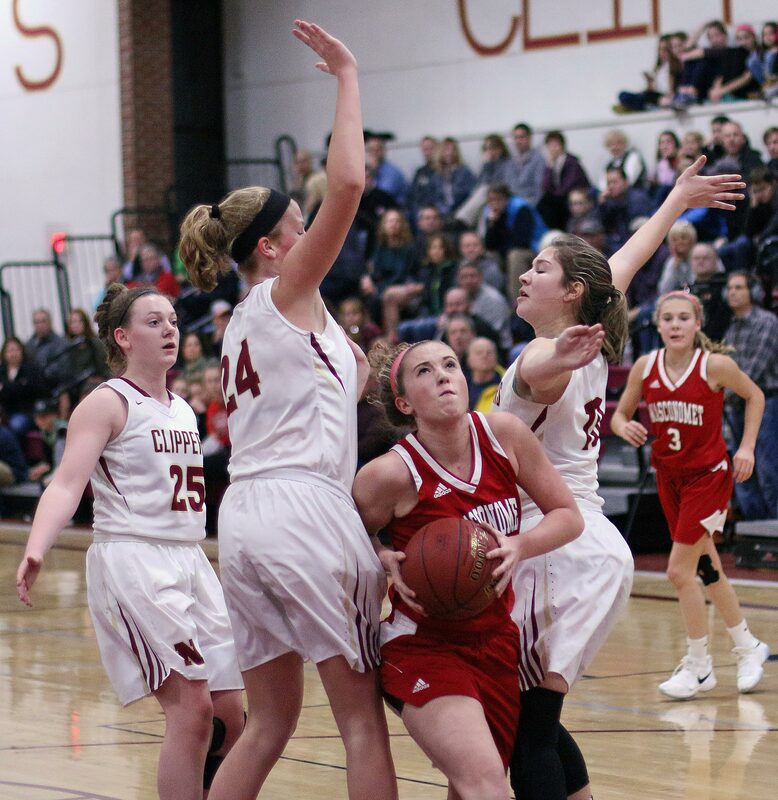 This was a tie game after six minutes before the Chieftains tallied the final three points of the quarter to lead 9-6. 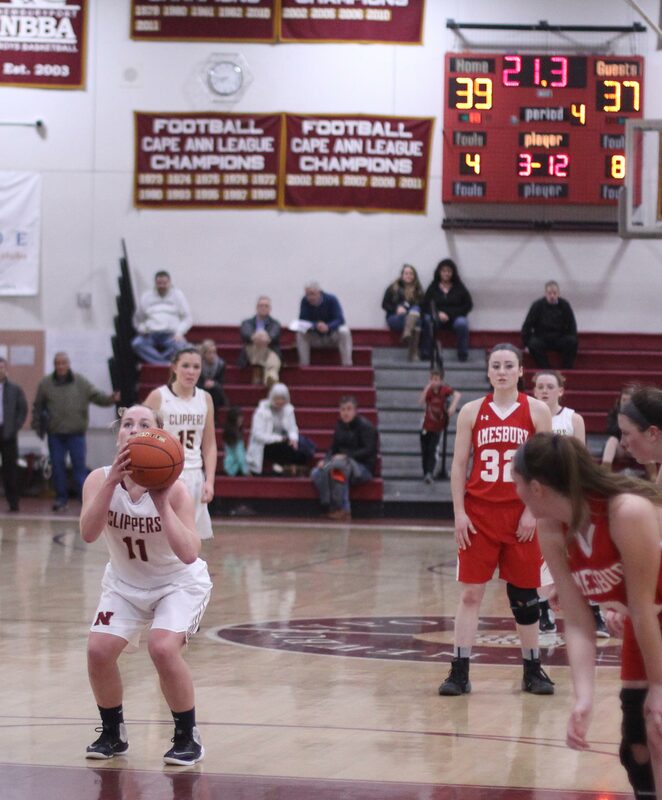 Anna Hickman started the second quarter with a free throw. 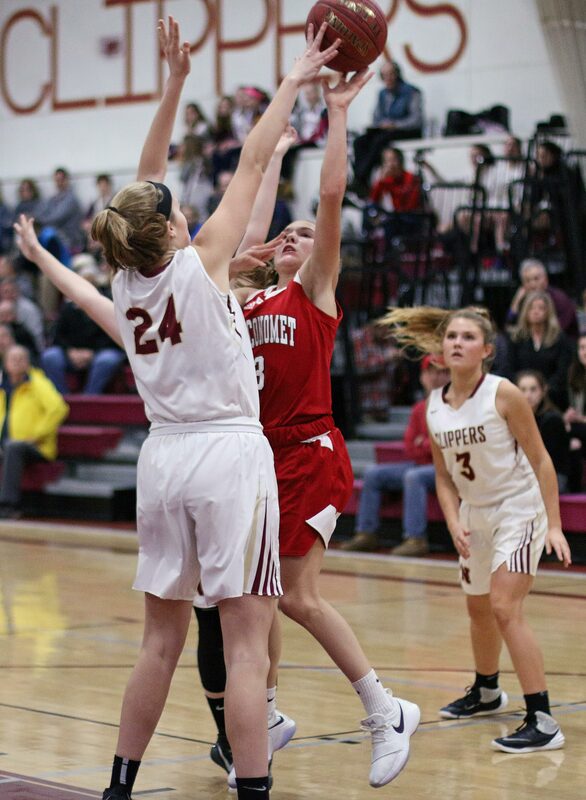 You sensed that this game might stay close after Nicole Amyouny missed two free throws in the first minute. 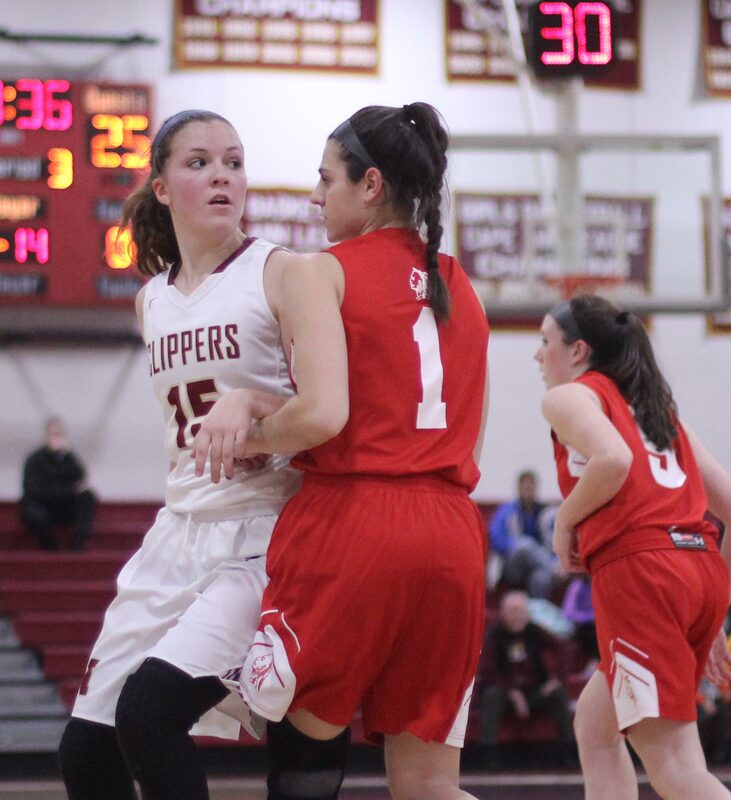 But two minutes later, Newburyport (7-1) was in serious trouble. 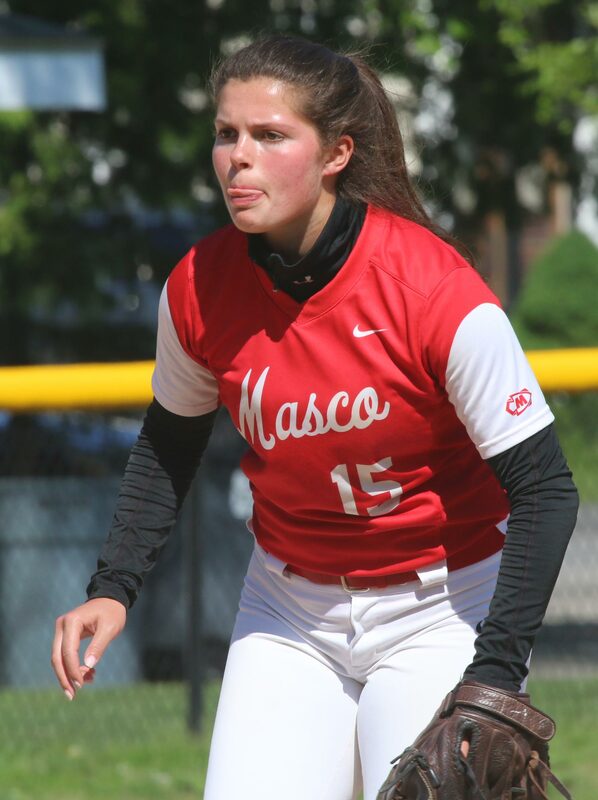 Masco put a string of thirteen unanswered points together and separated 22-7. 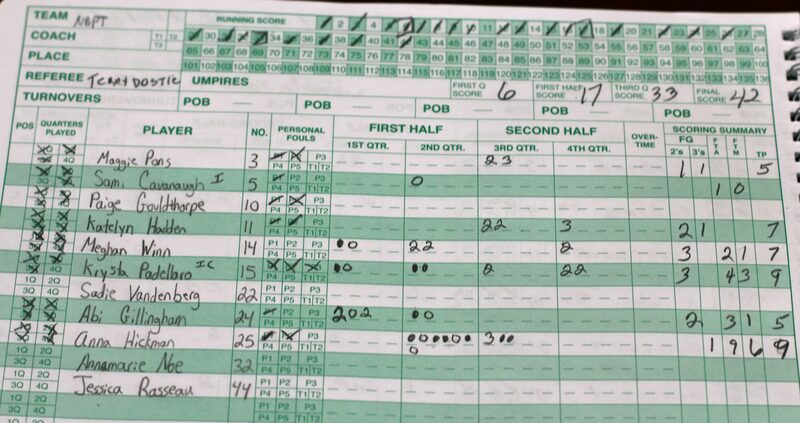 The home team never recovered although they did get back to within six points in the third quarter. 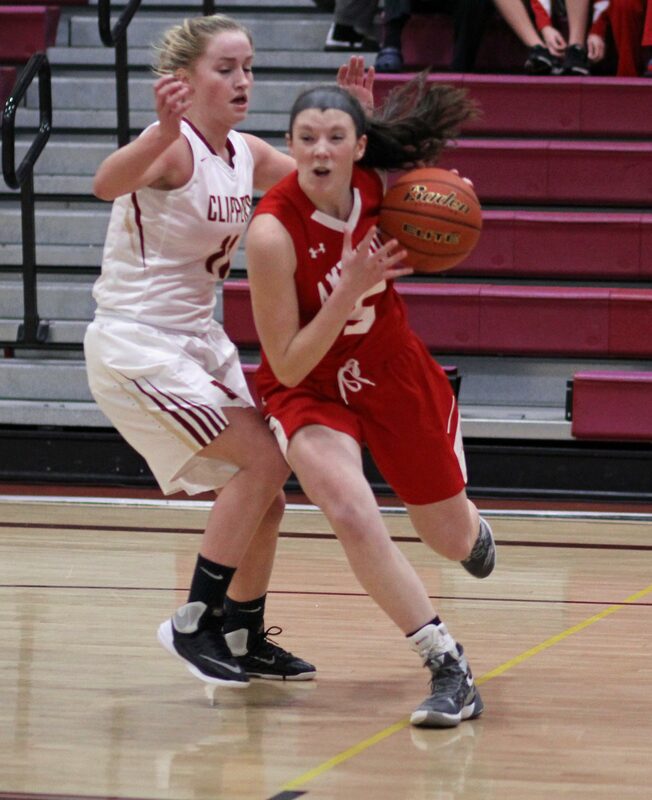 Two Masco freshmen (Olivia Filmore and Morgan Bovardi) sparked the breakaway segment. 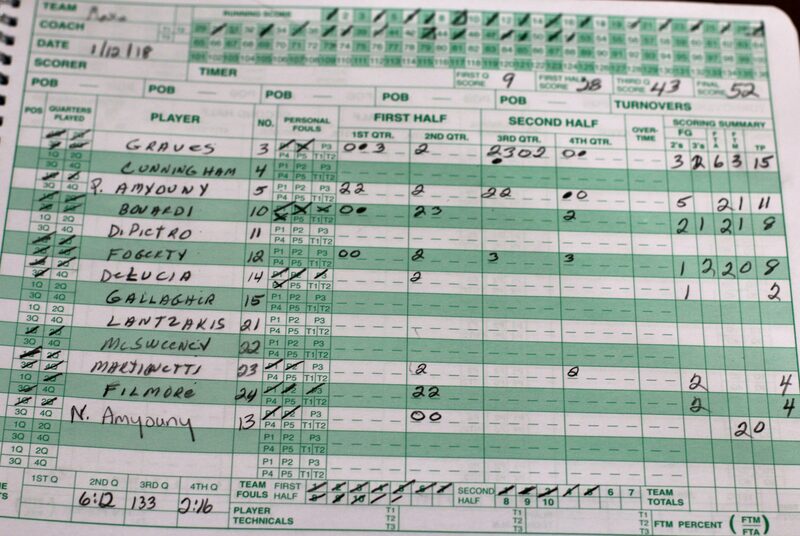 “They were impressive,” said Coach Romeo. 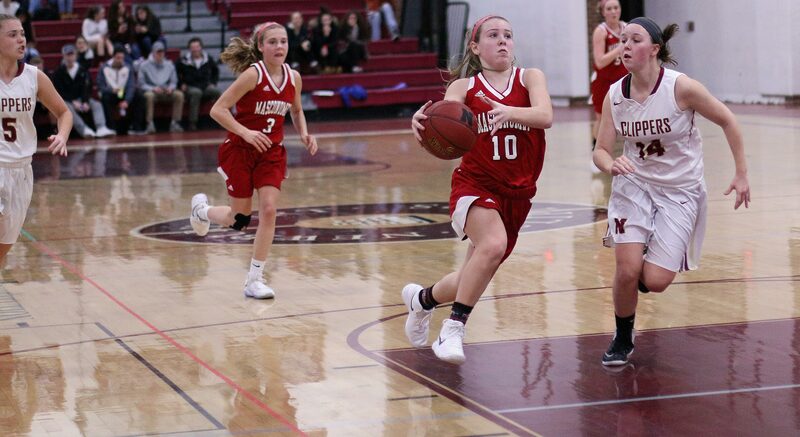 Olivia converted a missed free throw into a layup and then when teammate Paige Anyouny tossed a 3-point air ball, Olivia was under the basket to turn that miss into two more points. 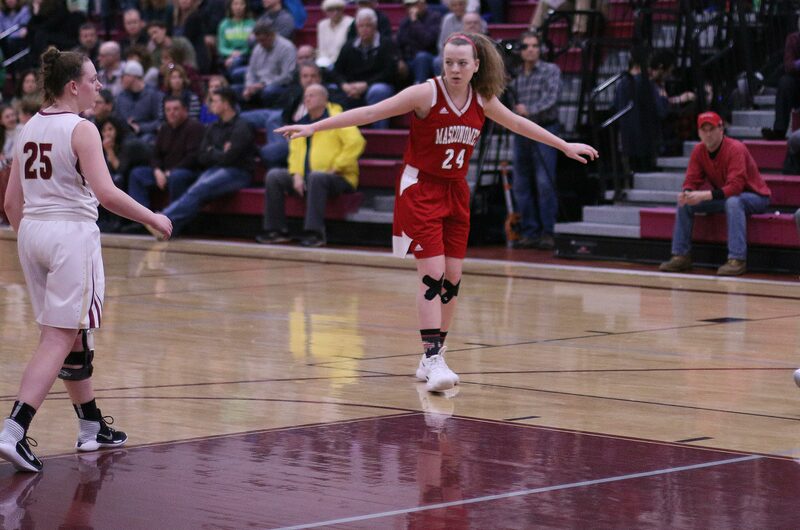 Morgan’s part was stealing the ball and getting a layup off the steal. 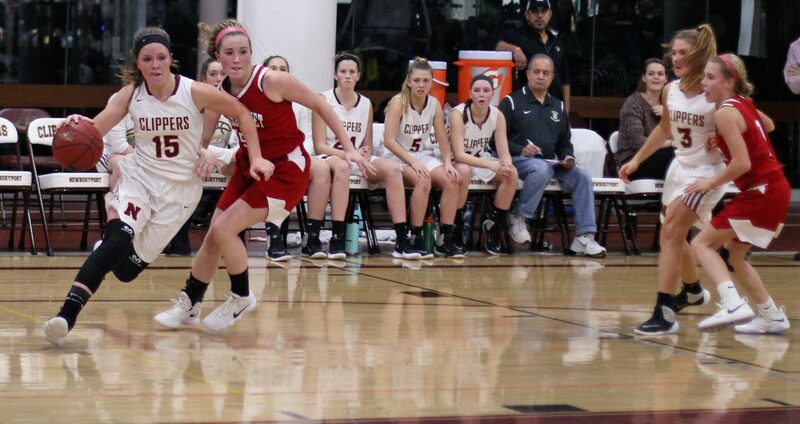 She followed those points with a three assisted by Mak Graves. 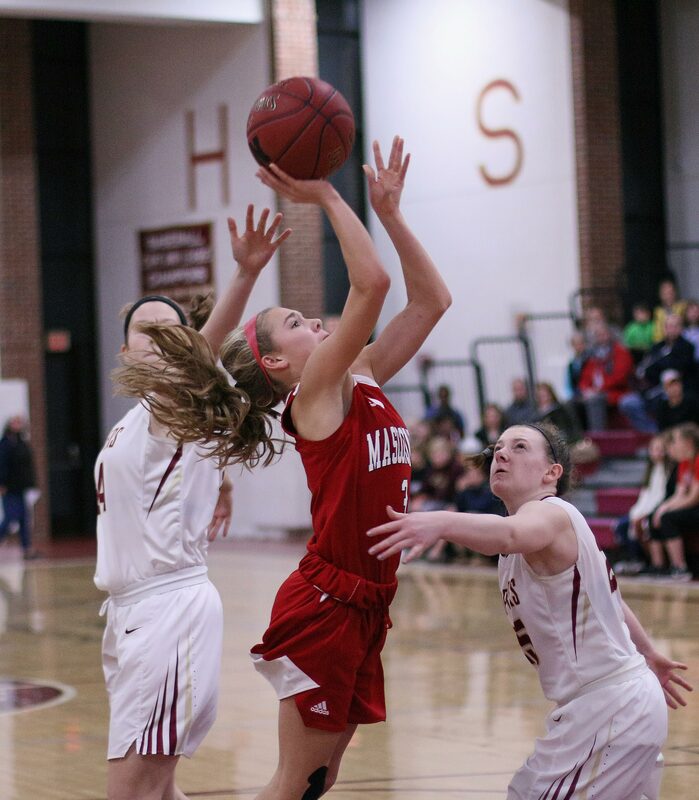 Mak Graves and Paige Anyouny collected the other two Masco baskets in the crucial 13-point run. You take those disastrous two minutes out of this game and it becomes anyone’s. 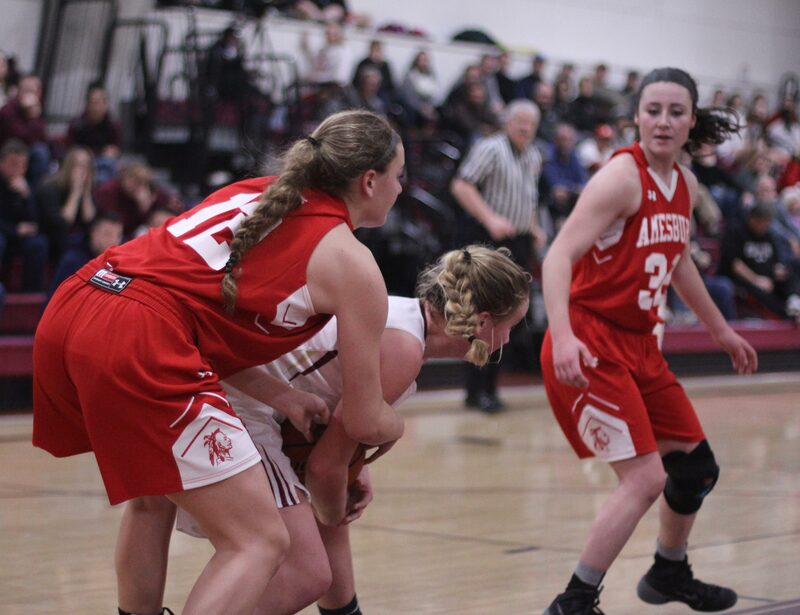 The best matchup of the night was between seniors Paige Anyouny and Krysta Padellaro. Both teams dug in on defense. 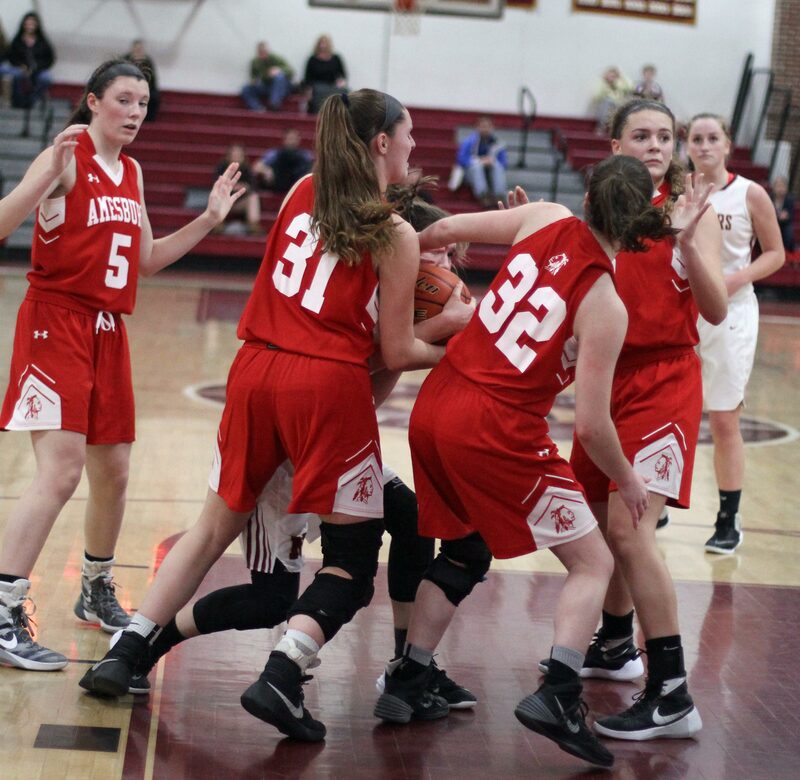 “It was two good teams going after each other for thirty-two minutes,” said Coach Romeo. 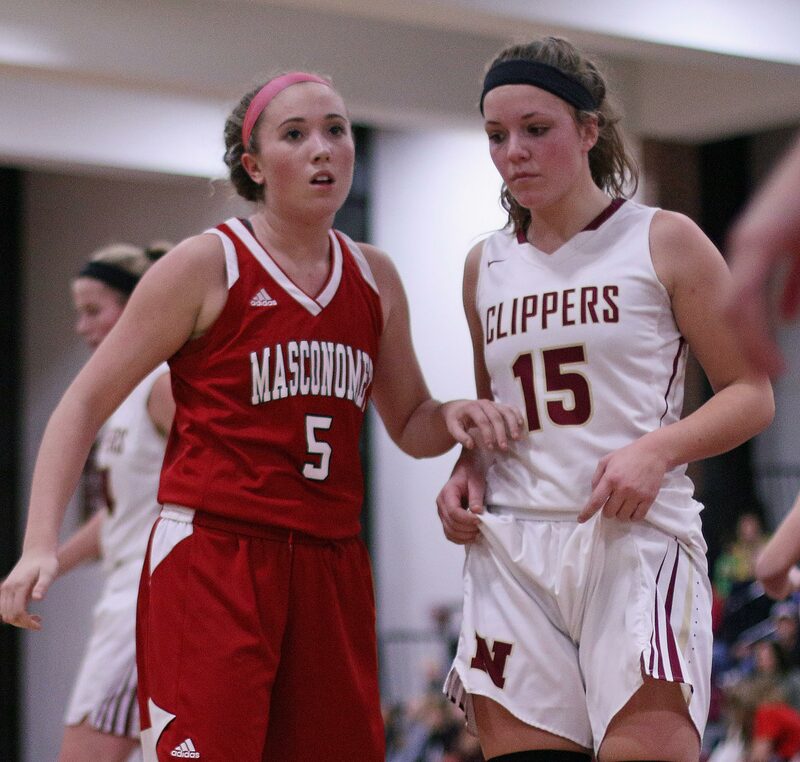 The potential for a long night started early for the Clippers when starter Katie Hadden picked up two fouls in the first minute. Out she came for most of the first half. 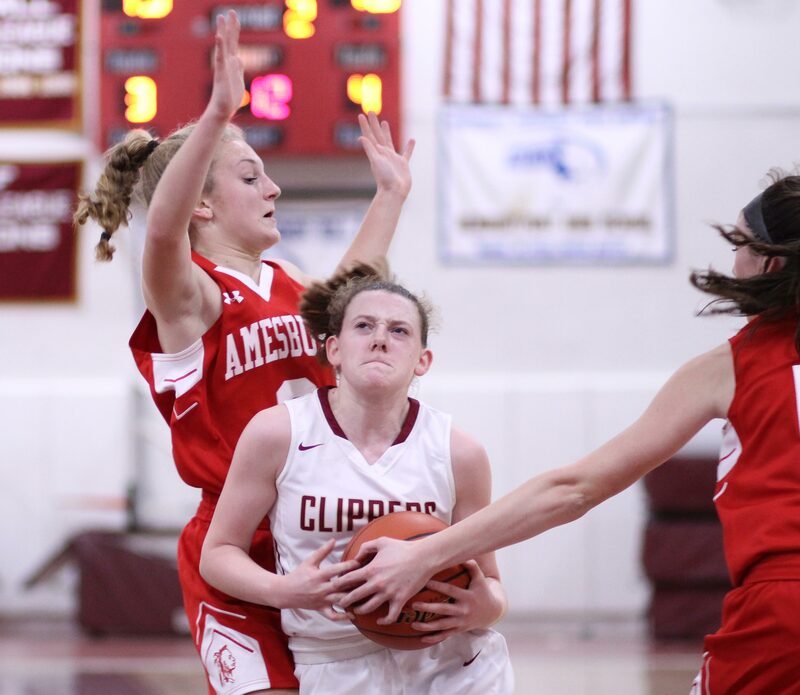 During Katie’s absence, the Chieftains (6-1) built the lead that the Clippers couldn’t overcome. “That hurt us a lot not having Katie for all those minutes,” said Coach Dollas. 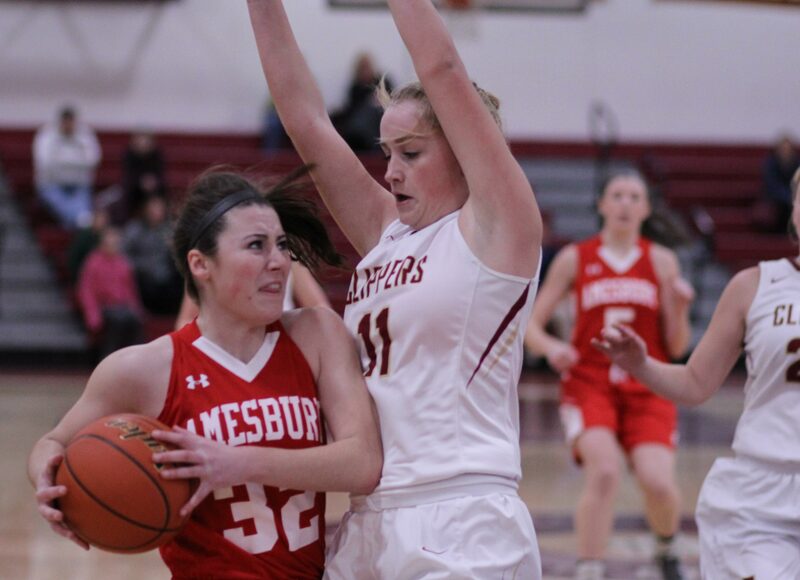 Abi Gillingham was called for a foul on this one. Don’t think so! 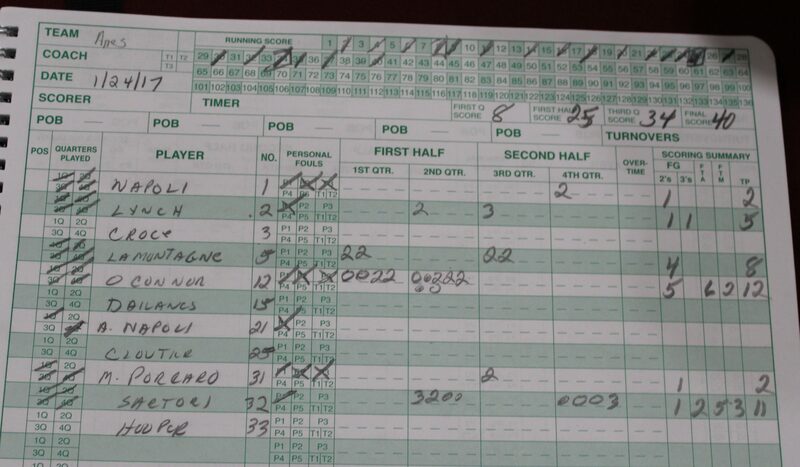 Because of the swarming man-to-man defenses by both squads, there was a fair amount of contact. 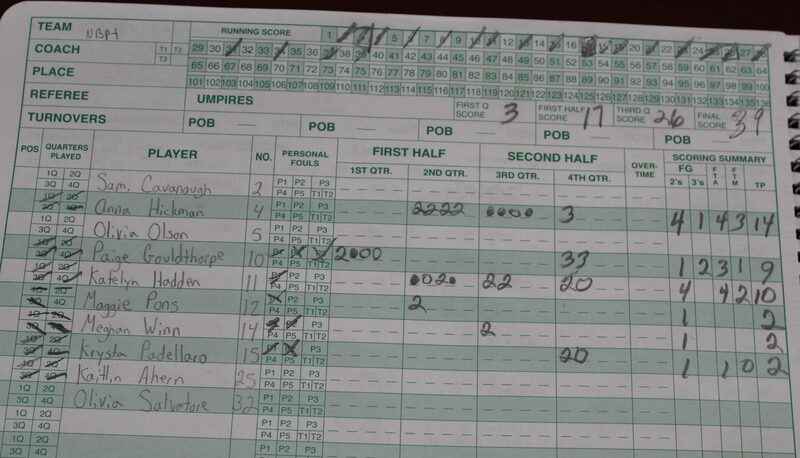 Fouls probably could have been called on every possession! 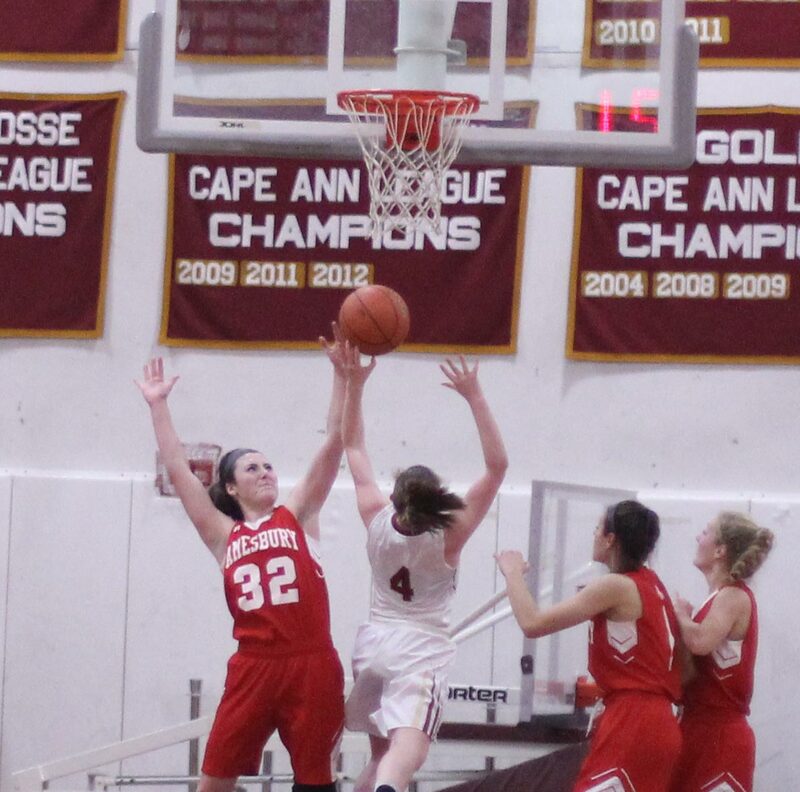 We might also still be at the Newburyport gym wondering when the game would end. 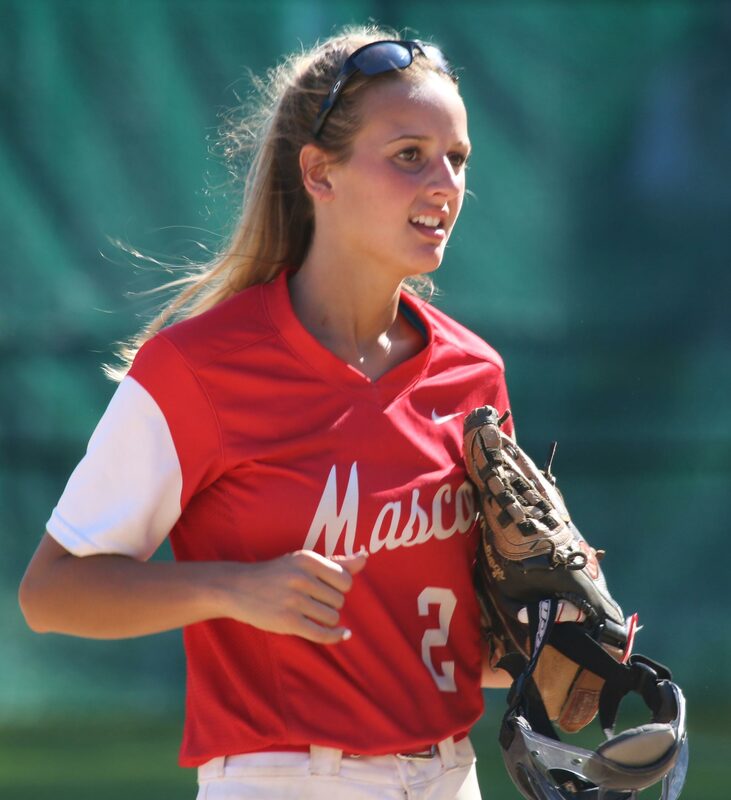 Masco lost to Pentucket this week, BUT Mak Graves didn’t play. Pentucket will be visiting Newburyport on Monday afternoon (1PM). 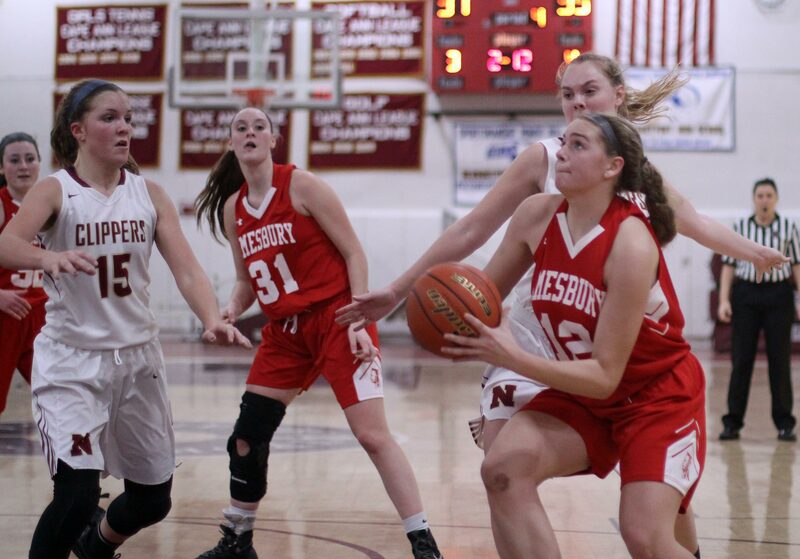 The full-court, high-energy Sachems will certainly be another test for Newburyport. We all got a chance to enjoy the impressive singing voice of Paige Gouldthorpe as she did the National Anthem. That girl does not need a microphone! 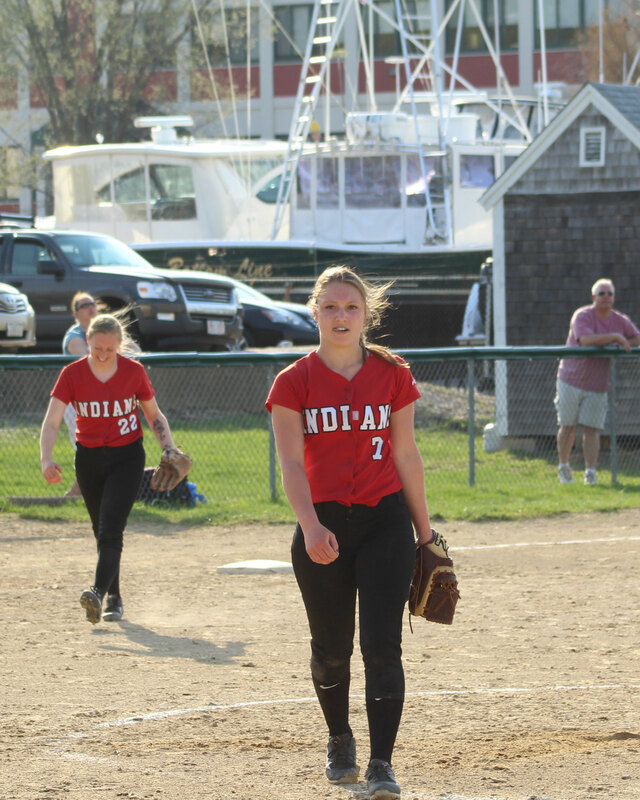 (Newburyport MA) That’s nine straight for the 2015 edition of Amesbury Indians softball. 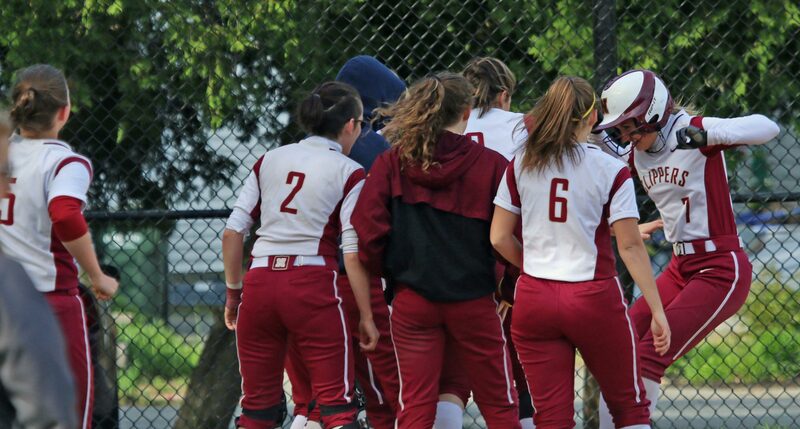 Coach Chris Perry’s team hasn’t lost since June 8th of 2014 when they were defeated by St. Mary’s (Lynn) 8-5 in the Division 3 North title game at Lowell. 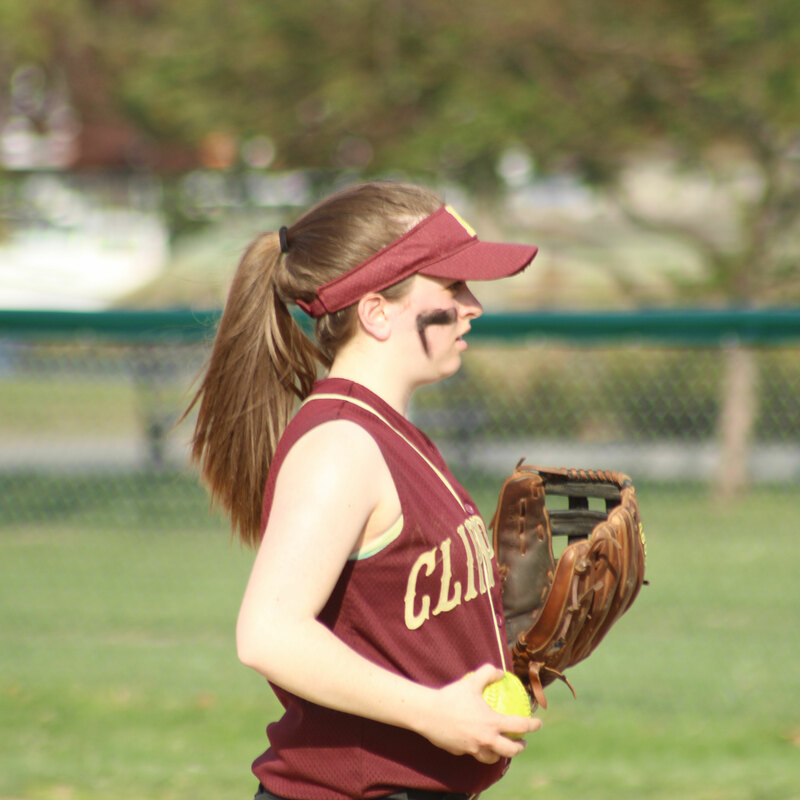 In Monday afternoon’s 5-2 win over Newburyport, the Indians again had strong pitching by Hayley Catania. 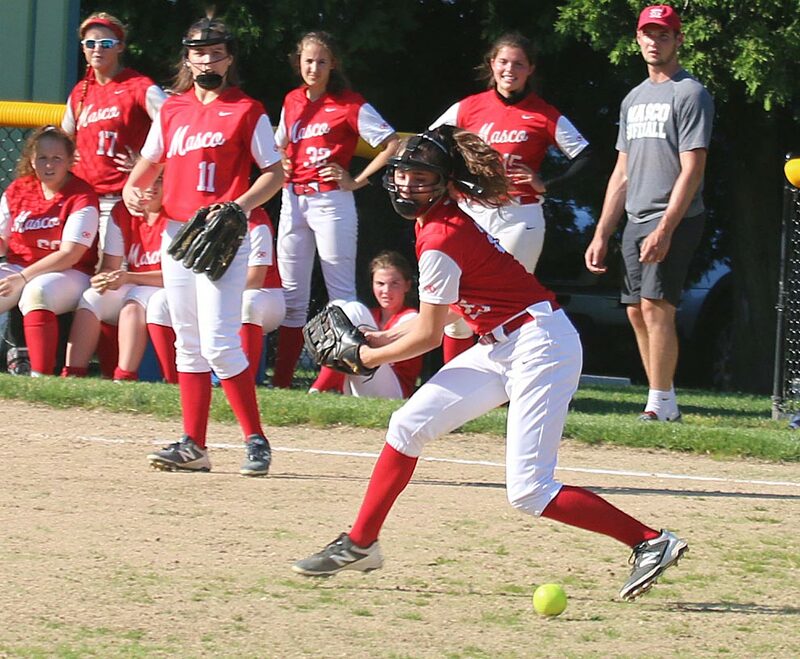 The freshman took a no-hitter into the final inning and allowed only two walks. Minus the quality start the Indians might have lost this game because their infield defense (six errors) and faulty base running (ran into three outs) kept the Clippers (3-5) just a big hit or two from the upset. Good teams find ways to win, however. 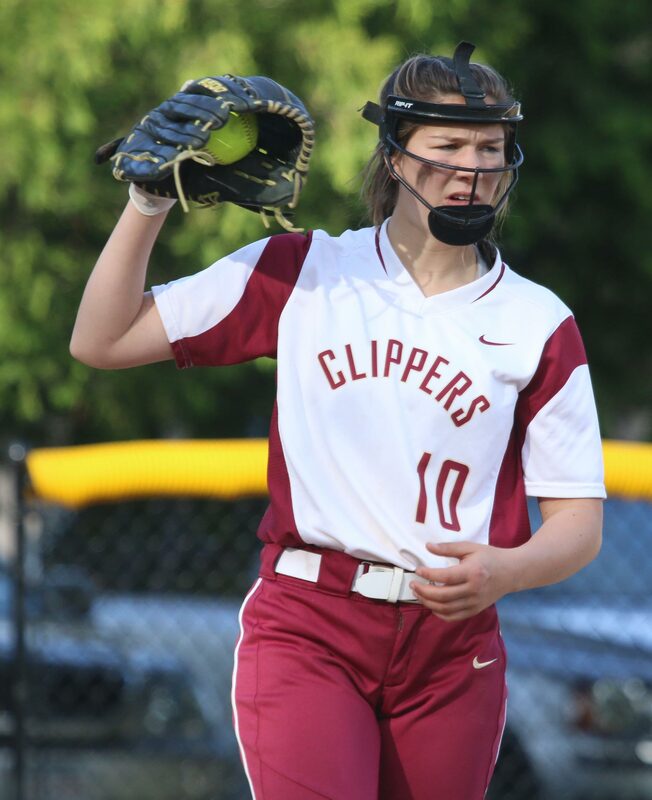 Newburyport starter Stephanie Gleason allowed only four walks in six innings of pitching but three of them came in Amesbury’s 3-run fourth inning. Two of the walkers would cross the plate. Big hit? 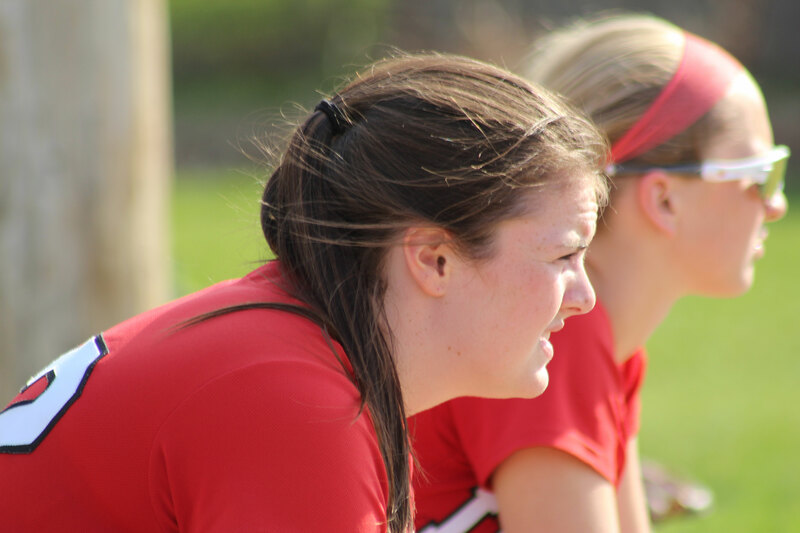 Megan Reid’s two-out double to right in that productive inning brought in two runs (Emily Robinson & Sam Stone). The Clippers got a run back in the bottom of the fourth. 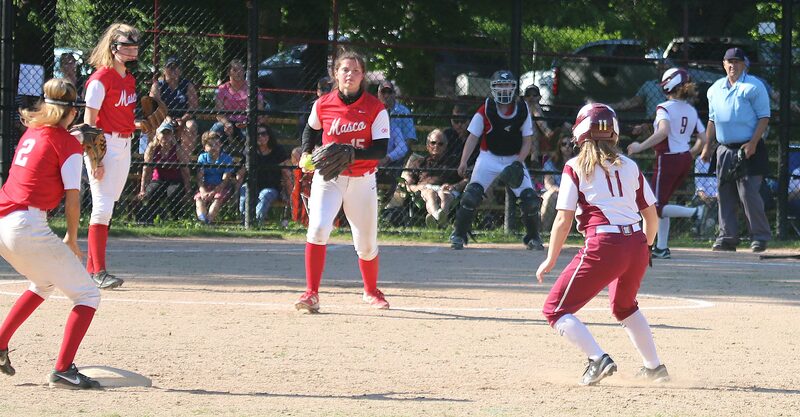 An infield dribbler by Stephanie Gleason tallied teammate Shelby O’Brien from third. 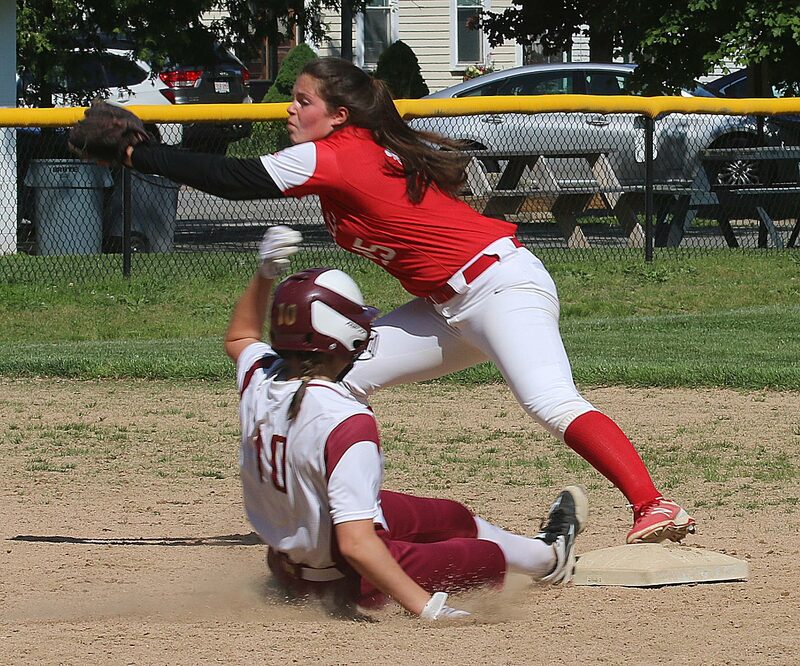 Amesbury built on their 3-1 lead with a unearned score in the sixth. 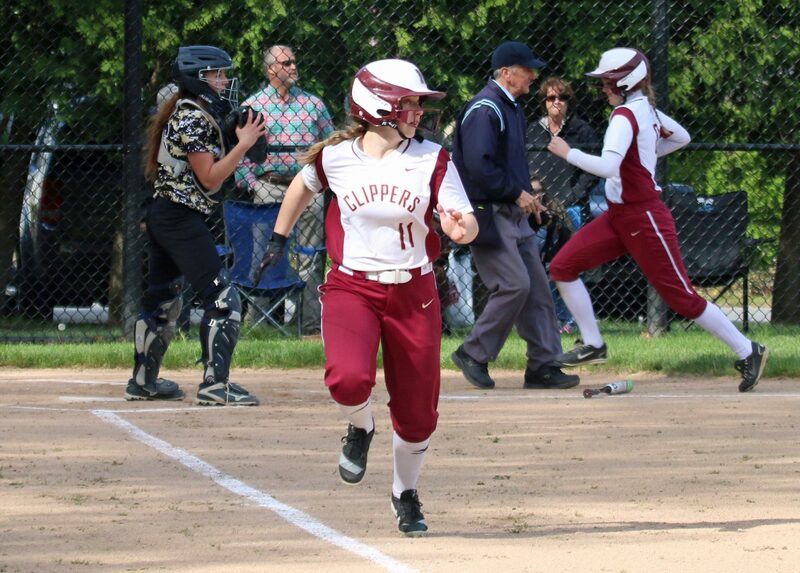 Zoe Fitzgerald singled, reached second on a wild pitch, and came home on Hayley Cantania’s two-out grounder got past shortstop Morgan Johnston. 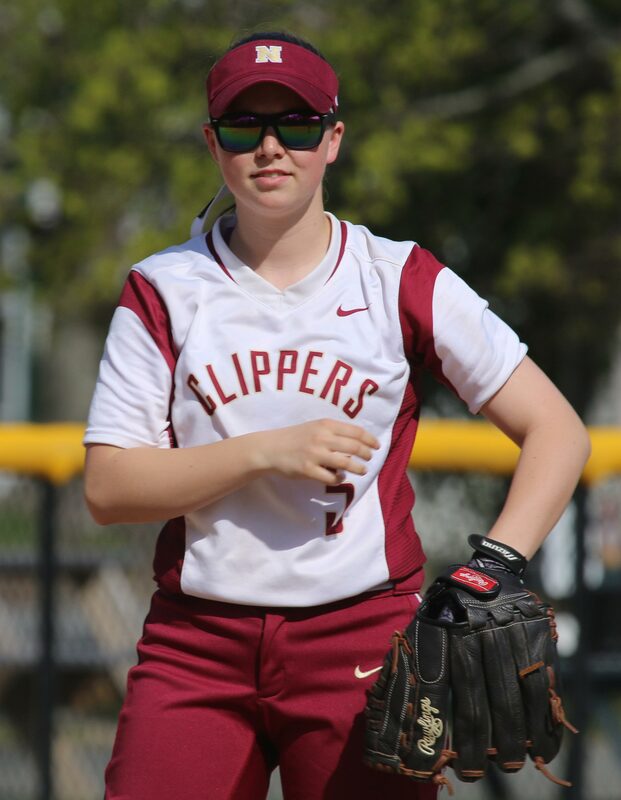 Newburyport picked up an unearned run in the bottom of the sixth as Jade Carpenter reached on one error (Maddie Napoli) and scored on another (catcher Caity Baker). 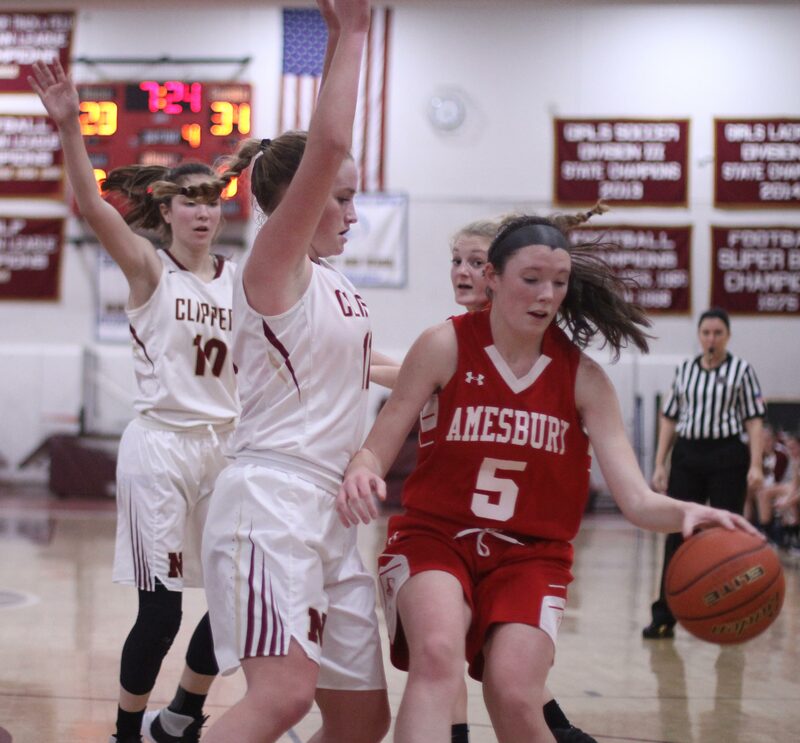 The Insurance Man arrived in the Amesbury seventh. 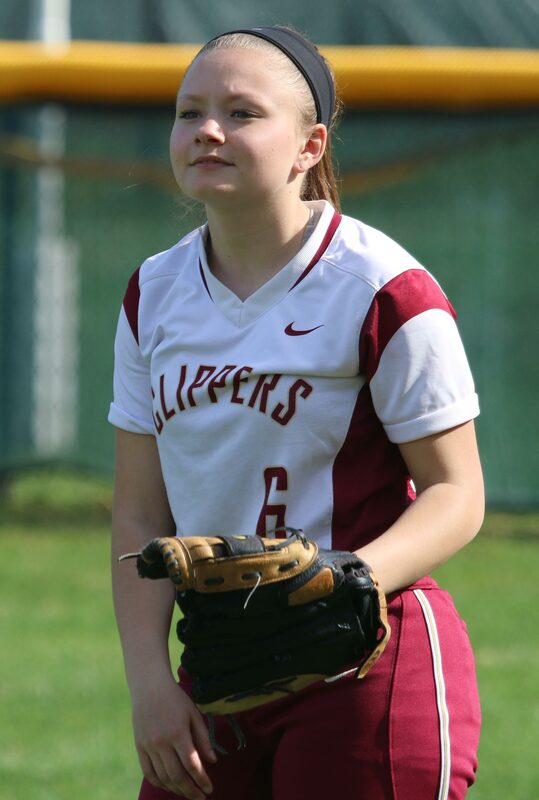 A two-out, three-base throwing error by 3B Carley Siemasko enabled Meagan Aponas to reach third. 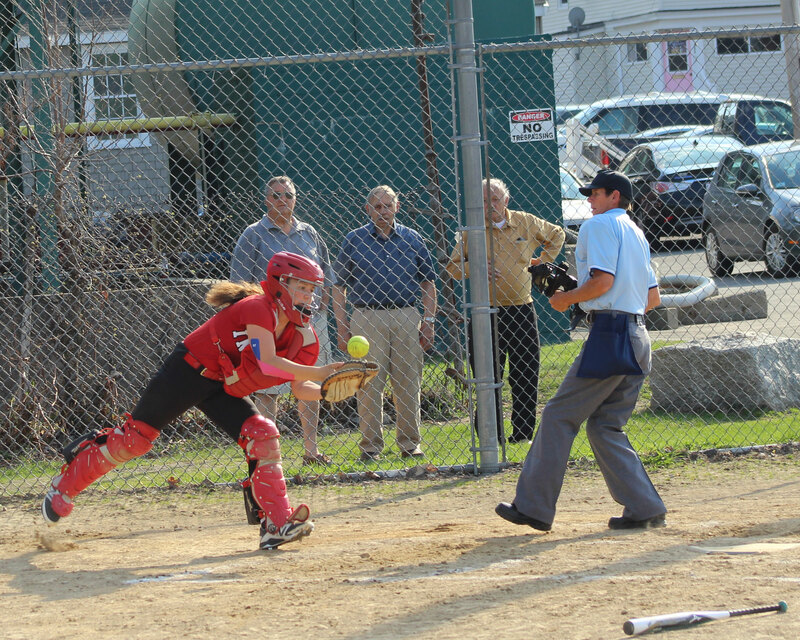 Autumn Kligerman’s single to left delivered Amesbury’s fifth run. 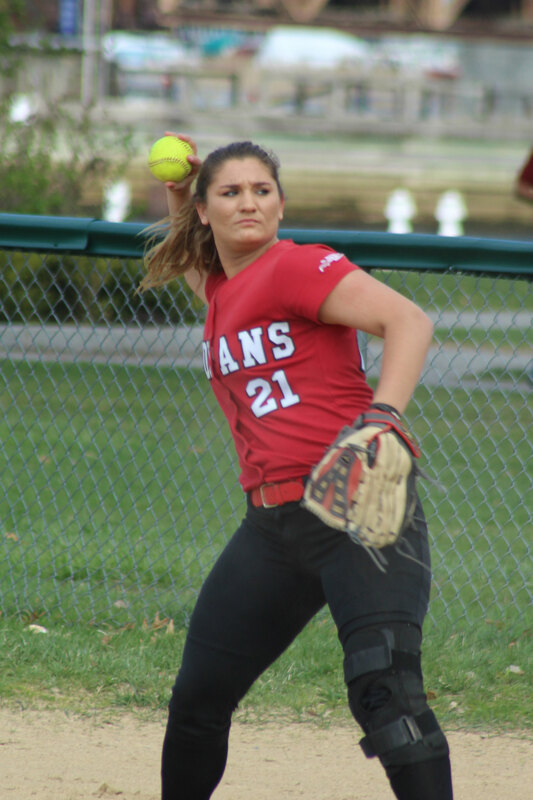 The big deal, at least in my head, was whether or not Hayley Cantania could get a no-hitter. It didn’t seem to matter to anyone else, however. 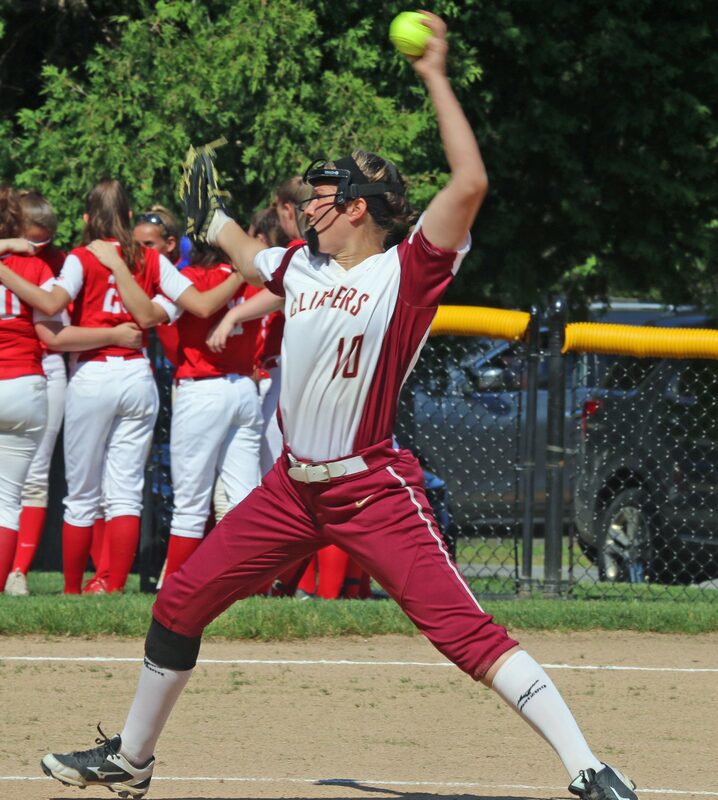 Regardless of the lack of interest, Paige Gouldthorpe started the last of the 7th with a line drive to right. 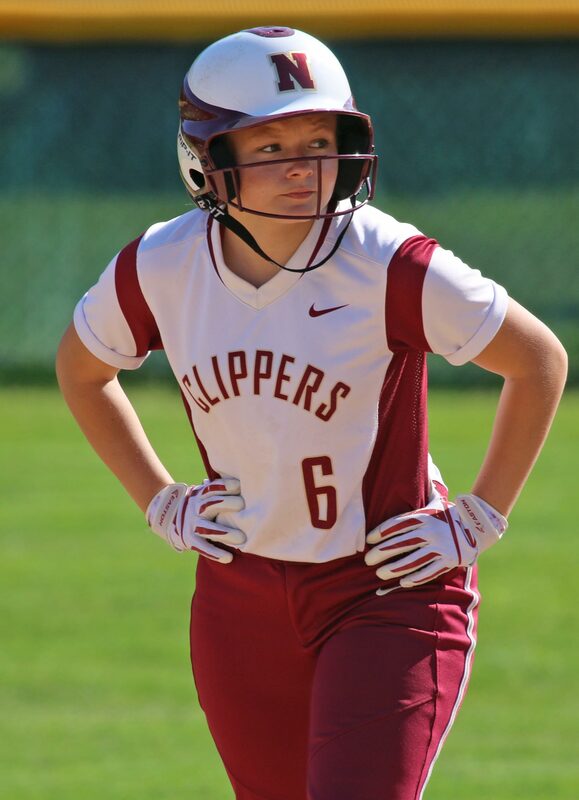 Megan Reid charged it but it bounced in front of her and then away from her to give the Clippers their first (and only) hit. 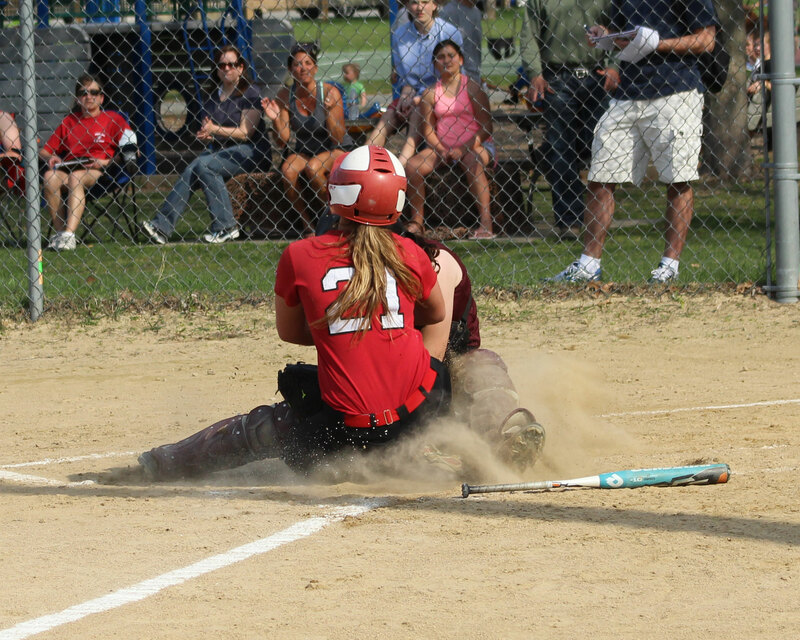 Hayley Catania reached base all three times – single, walk, and error. 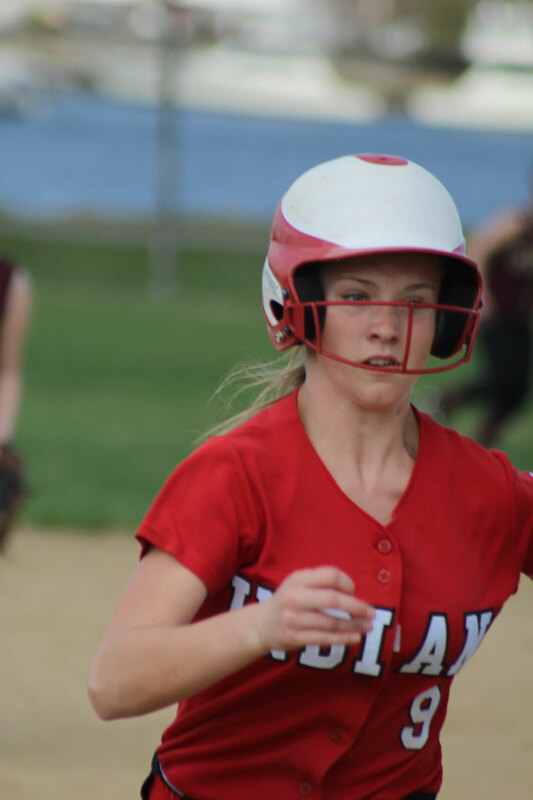 Zoe Fitzgerald scored two runs. 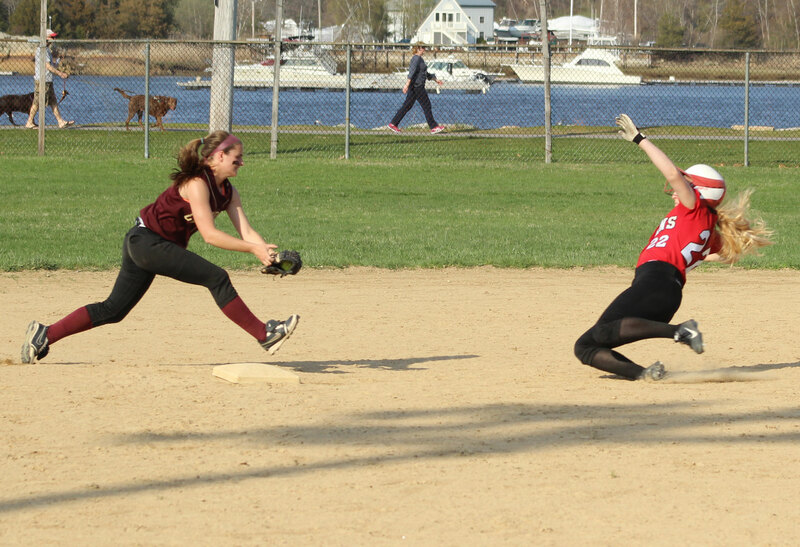 Paige Gouldthorpe made several terrific plays in left field for Newburyport. 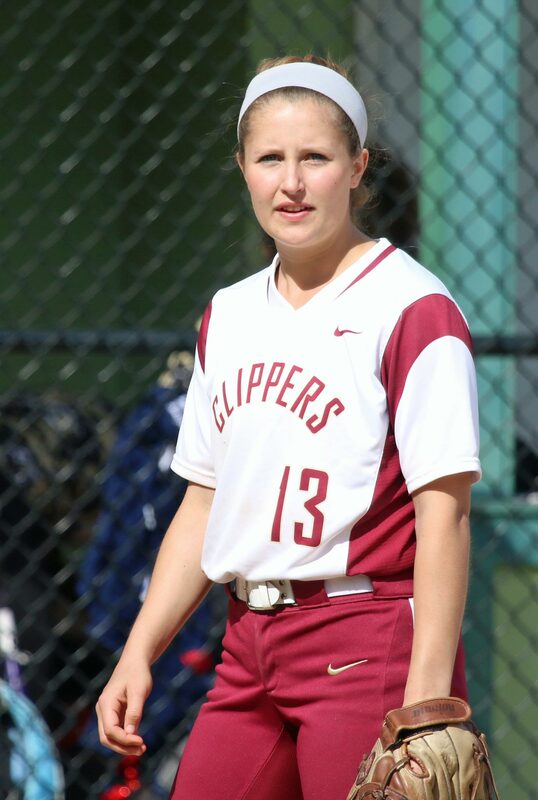 Molly Kelley pitched in the 7th for the Clippers. 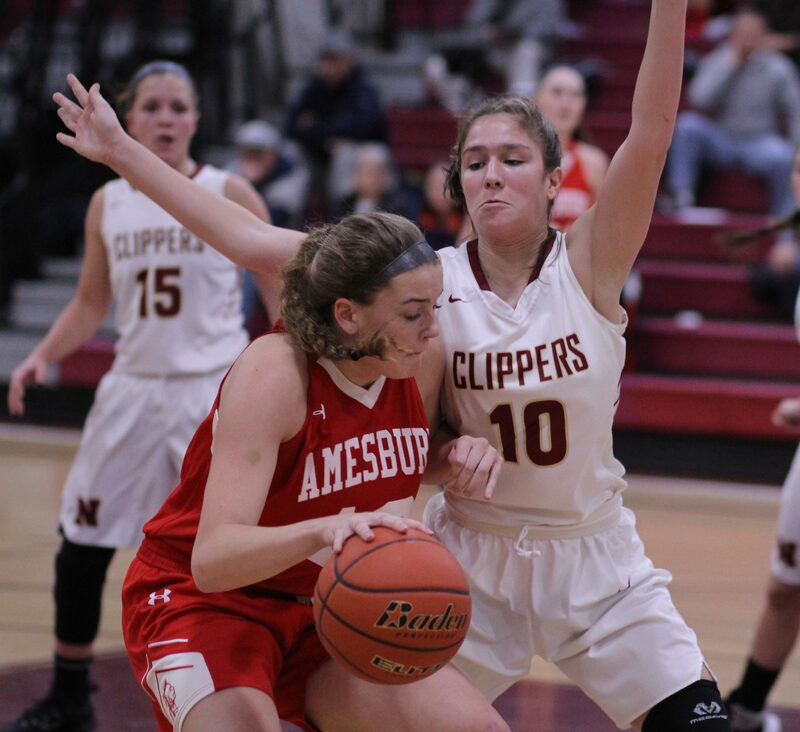 With the win, Amesbury sweeps the season’s series with Newburyport. 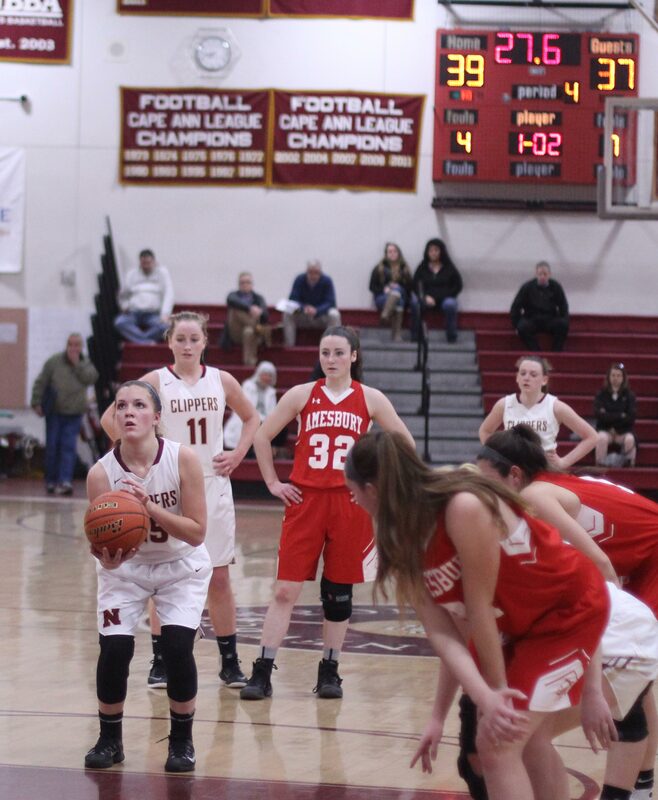 Last year Newburyport won both meetings. Weather? It was shockingly nice! Temps in the 80’s with a nice breeze is about as good as it gets in these parts. 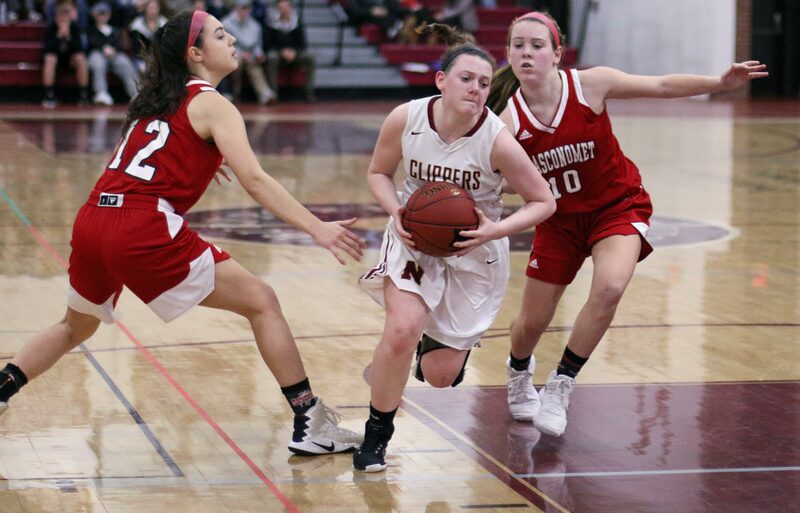 Next game for Newburyport is at Ipswich on Wednesday. On the same day Amesbury will host a pretty good Pentucket team.